The most noticeable thing about Europe for me, as a traveller, was the stark contrast in culture between the dozens of different countries that were all relatively close to one another. European cities mostly all seem to have this inherent charm about them – something that I suppose comes from never having lived in Europe – but beyond that every country had its own kind of culture that rendered it distinct from its neighbours. While I don’t want to rely too heavily on stereotypes, I often found that a lot of aspects about each country or city – the language, the cuisine, the friendliness of the people, their favourite pass times, their daily routines – were surprisingly congruent with most of my expectations. The French guys loved huge brunches full of gourmet food and lazy afternoons of drinking, with every type of wine imaginable readily on hand, yet they blew the preconceptions of rude, arrogant Parisians right out of the water. The Danish were friendly and soft-spoken people who rode their bikes everywhere and were always so proud of their idyllic little country, but were never, ever ones to brag. The Spaniards lived up the expectations of their siesta culture, all but disappearing during the day, only to reemerge in the early hours of the morning, with fire in their hearts, drinks in their hands and dancing shoes on their feet. The Germans drank beer like it was water – since half the time it cost less anyway – and in Berlin everyone from the artists to even the politicians seemed to wake up at 2pm. The Austrians were friendly and accommodating, though they resented that the Germans usually didn’t appreciate the linguistic differences between the Austrian German and their own. 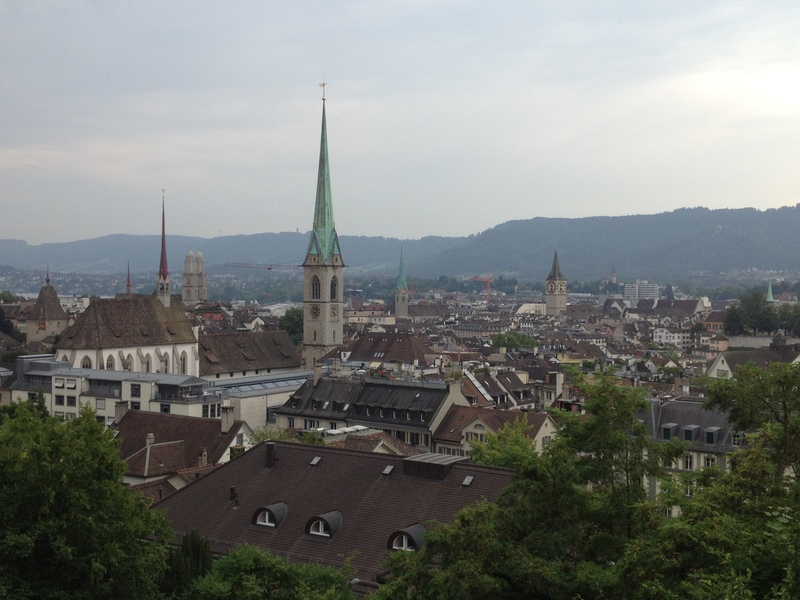 The Swiss seemed so content in their high quality of life that everyone was so happy, and you could completely understand how they have come to be considered such a neutral player. The Italians were late for everything, and nothing could be cooked as well as their grandmothers recipe. The Czech men thought their beer was better than the Germans, but they were happy to remain less renowned and keep to themselves with their gorgeous fairytale cities like Prague. The Dutch were loud and friendly, and also rode their bikes everywhere, the English were drinking tea whenever they weren’t drinking alcohol, and the Irish were just perpetually drunk. Wait, what did I say about not using stereotypes? But really, the actual proximity of all these countries and cities is really quite astounding for someone who comes from Australia. I could jump on a train for several hours and I would suddenly be in another capital city of another country, where they speak another language and use a different currency. All within the space of a continent that could practically fit inside the landmass that is my home country. That all these places could be so physically close but so culturally distant is still, and probably always will be, the thing I found the most fascinating about Europe. Currency within Europe is also an interesting consideration. Despite most of the continent being economically unified under the euro, I still encountered a number of other countries that were yet to make the switch, with many of them seeing no reason to change any time in the near future. Denmark have the Krone, Sweden have the Krona, Switzerland still uses their Francs and the Czech Republic currency is the Koruna, and of course Britain has hung onto the Pound Sterling. There was some places such as major travel terminals, on trains, and on the ferries between Finland and Sweden and Wales and Ireland, that would accept both euros and a second currency, but generally speaking you had to have the right currency for the country you were in, which meant withdrawing new money in each of those countries – there was no point exchanging the euros since I was inevitably heading back to a country where I could spend them, so I just had to hang onto them – and then making sure I exchanged them back into euros before leaving that country, lest I was stuck with handfuls of coins that weren’t able to be spent or exchanged in any other country. All I can say is that I was glad to be doing my Eurotrip in the time of the euro, and not back in the day were every country had their own currency. I would have had to withdraw cash at a lot more ATMs, and do a hell of a lot more conversions in my head. 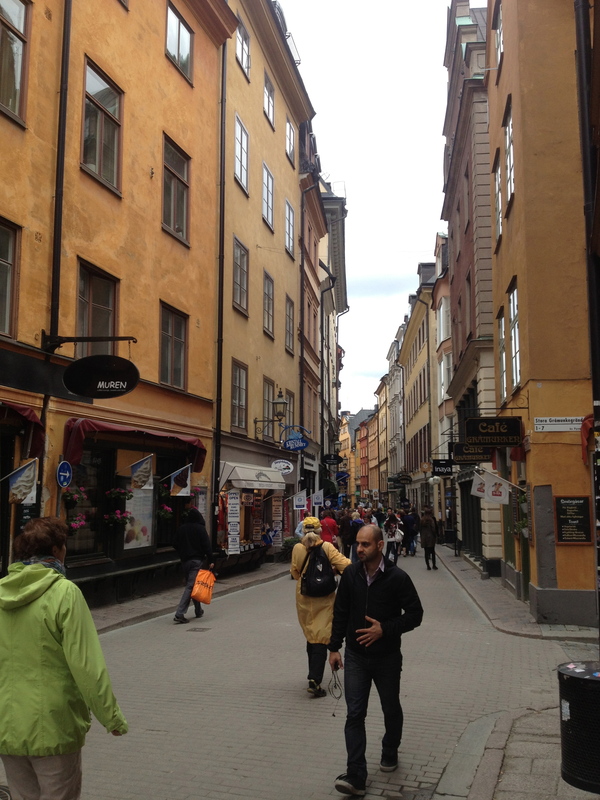 Something else about Europe that I really took a liking to was the buildings and architecture. Not just the famous sights and structures that I saw during my trip, but even things as simple as the houses on the street. 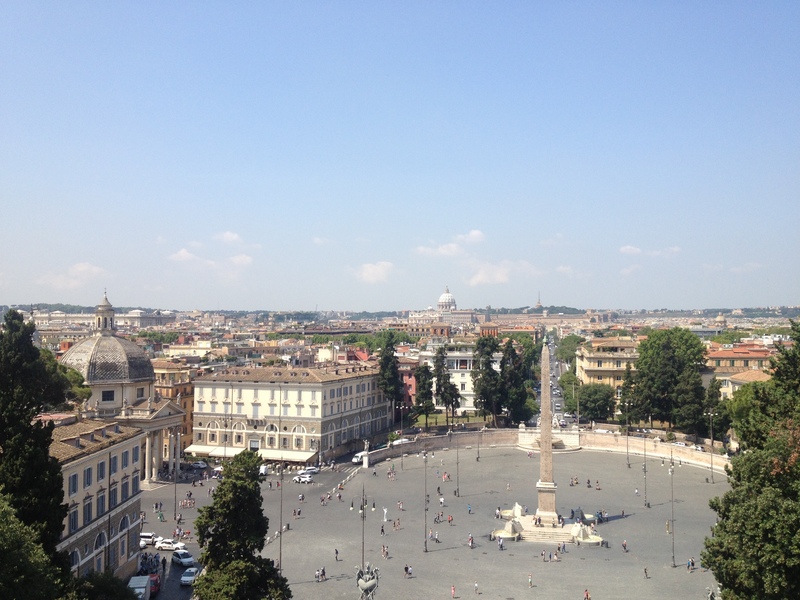 While it was crazy to consider the fact that I could walk down a street in Rome and just casually pass the Pantheon, a building over 3000 years old that has been in place longer than any of the buildings in Australia, I also loved the styles of houses and apartments in places like Paris, the Netherlands, and even the outer German suburbs on the outskirts of Berlin had some adorable little homes that looked like something about of a storybook. But I suppose with the older buildings comes a real sense of history – just knowing how long some of these buildings had been there gave them the ability to appear classical and somehow timeless in my mind, when likening them to my comparatively very new and modern hometown. The hours of daylight were also something that took a lot of time to get used to. There were days when 10pm snuck up on me rather rudely, and suddenly all the shops were closed but I hadn’t had dinner yet because it was still light outside – although on the flip side the early sunrises meant that I stayed up well past dawn on some of my nights of partying, though I wasn’t even out particularly late by my own standards. I was blessed with a freak run of amazing weather and beautiful sunshine during my tour of Europe, with hardly any rain or cold weather. But to be fair, I had planned my time in Europe to be in the summer, mainly because the idea of lugging all my winter clothes around on all those trains seemed a lot more of a hassle than it would be worth. Now that I’m back in Europe, though, I’ll have to brace myself for the sheer cold that will eventually be upon me – I have the summer to look forward to first, but winter is coming. But perhaps one of the things that I found most enchanting about Europe was the amount of languages that I encountered. Almost everywhere in Europe it was rare to find a person who could only speak one language. Luckily for me many of those people had English as their second (or third) language, so I was able to get around and meet people with relative ease, but I would watch on with a mix of amusement and… awe, I guess, at the way they could seamlessly slip between foreign languages. It made me partly jealous, but I also found it rather inspiring too. Being bilingual or multilingual had always seemed like such a cool and useful skill to have, but the reality in Australia is that people who don’t speak English are few and far between, and there is no one common second language that serves to unite the people of the country under some cultural identity. While the cultures of each country try to stay well-defined and separate, Europe as a continent has become a melting pot for so many languages that multilingualism is just a common, everyday fact of life. Now that I am living in Germany I am trying my best to learn German, although it’s a lot harder than all these native speakers make it out to be. It’s challenging, but it was definitely one of the things that I took away from my time in Europe and have carried with me ever since. Although if truth be told, once again it was the people I met during my time in Europe that made the journey so amazing and memorable. 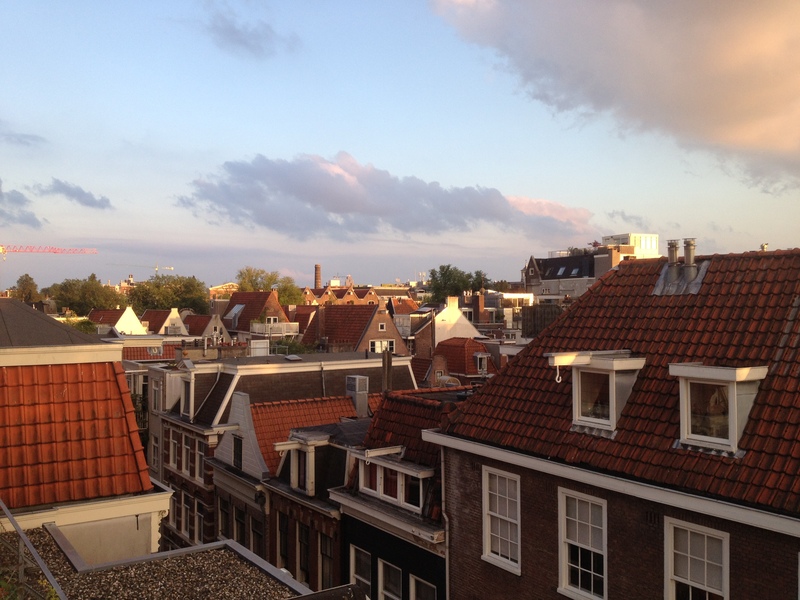 I really got into the Couchsurfing community, which is something that I could not recommend highly enough, particularly for anyone who is travelling alone. Sure, perhaps I didn’t see all of the “must see” sights in every city, but I did something that in my opinion was a lot more valuable – I made a lot of friends, locals who showed me sides of their hometowns that many tourists wouldn’t get the chance to see. My gratitude is endless to that long list of people, all of whom you’ve encountered in one way or another by reading my blogs. Experiences like that really make you appreciate that travelling is not about a particular place or destination – it’s about the journey you take to get there, and the things you see, the people you meet, the parties you dance through, the food you eat and the memories that you create along the way. I could quite literally rave forever about how much fun Europe was and how part of me never wanted it to end, but I just don’t – and didn’t – have that kind of time. Because as that plane took off from Dublin airport, my teary-eyed self soon perked up because I had something just as big and diverse and exciting to look forward to: I was on my to the Land of the Free, the one and only United States of America. The train from Prague to Berlin was probably one of the worst trips in the whole of my travels through Europe. It sat idly at the station for over half an hour before it finally departed from Prague, and suffered major delays along the way. Parts of the air conditioning weren’t working, and the cabins inside the train were reaching ridiculous temperatures, with everyone on the train dripping in sweat before we were even halfway there. When the train attendants came down the aisle at one point handing out bottles of water to everyone, I knew that the problems were actually pretty serious, and I had no hope of getting to Berlin at my previously anticipated time. But as it is with such unavoidable nuisances, all I could do was sit there in the stinking hot train with a bunch of other travellers around me. Everyone was was so hot and bothered and looking rather fed up with the whole thing that I wasn’t even going to bother trying to strike up a conversation to pass the time. I listened to my music, read my book, and closed my eyes, dozing off and dreaming of my current destination. 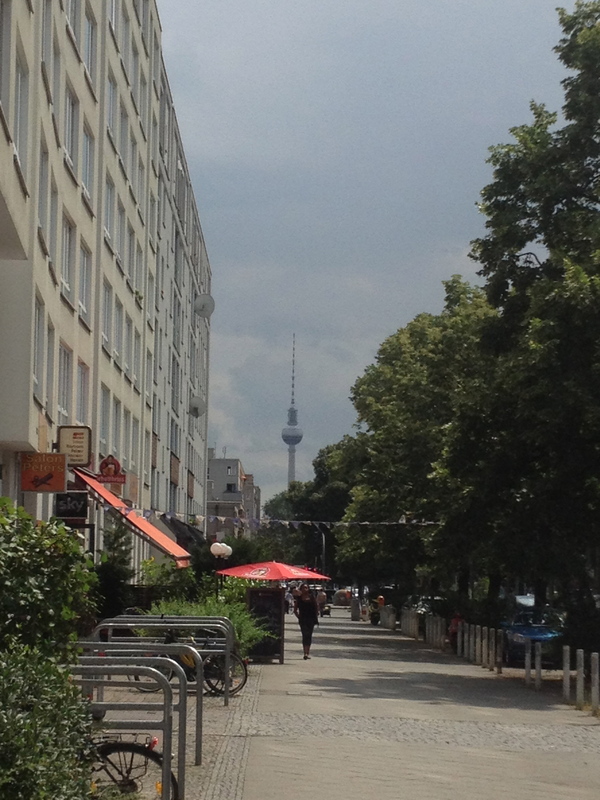 The last time I was in Berlin I had stayed with my family friend Donatella and her assortment of wild and zany housemates – Lola’s words about never leaving the city were still nagging at the back of my mind as I found myself drawn back to it. But after meeting and staying with him for the last two nights of my previous stay, Ralf had said that I was welcome back to stay with him any time I was in Berlin. I don’t think he had anticipated my return being quite so soon, but he agreed to let me stay with him when I told him I would be coming back on my way west to Amsterdam. I’d really enjoyed the brief time I had spent with him last time, so I was pretty excited to seem him again. Of course, the train was running late, so some of the logistics in actually finding each other were a little difficult. Yet when I stepped off the train at Berlin Hauptbahnhof there was a slightly different feeling that I hadn’t felt in quiet some time, and that was the feeling of returning to a familiar city. Not since arriving back in Bangkok after the bus ride from Hell had I arrived in a city where I was able to say: Yes, I recognise this place. I know where I am and I know where I have to go. As much as I love the excitement that comes with discovering a brand new place and city, that kind of familiarity with a place is strangely comforting. When I finally met Ralf – and had changed out of my soiled travel clothes, showered and freshened up – we had dinner, and I told him all about the adventures I’d had throughout Europe since I had last seen him. He listened and smiled as I told him my stories, and I was glad I had come back to Berlin – that adorable smile was the cherry on top of all the things that I already loved so much about the city that had drawn me back here. Ralf had to work during most of the week, so I had to find other things to do to amuse myself. I spent a lot of time just resting and hanging out, happy to have a place to myself while Ralf was out, but one of the major things to do in Berlin that I hadn’t gotten around to doing last time I was here was see the East Side Gallery, which is actually the painted and decorated remains of the Berlin Wall. I had only briefly seen it in the dark with Dane on our first attempt to get into Berghain, and I wanted to go back and really take it in. 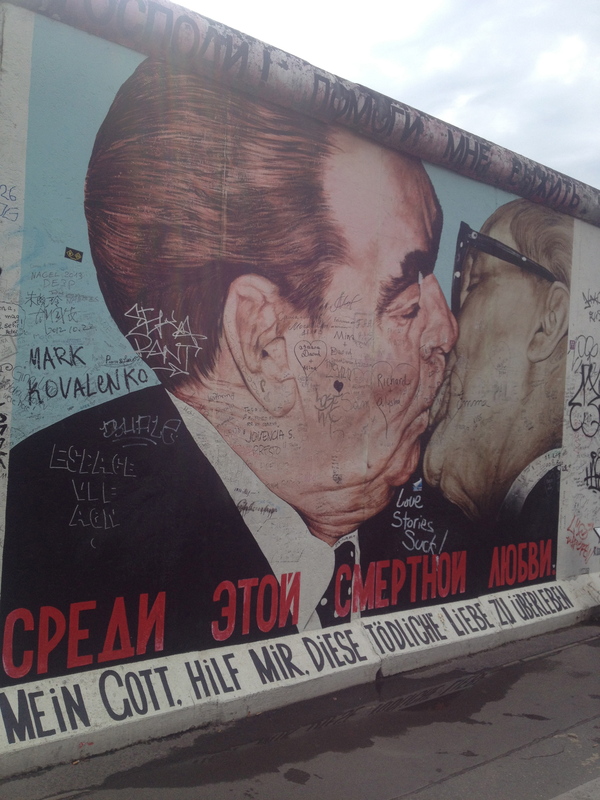 I have to say, I had seen to some pretty amazing art museums on my travels – famous notables include the Hermitage in St Petersburg, the Louvre, and the Vatican Museum – but I have to say that out of all of them it was the East Side Gallery that captivated me the most. The artworks are such a diverse collection, from detailed masterpieces to simple murals that could have been done by children to sections that looked more like elaborate graffiti more than anything else. 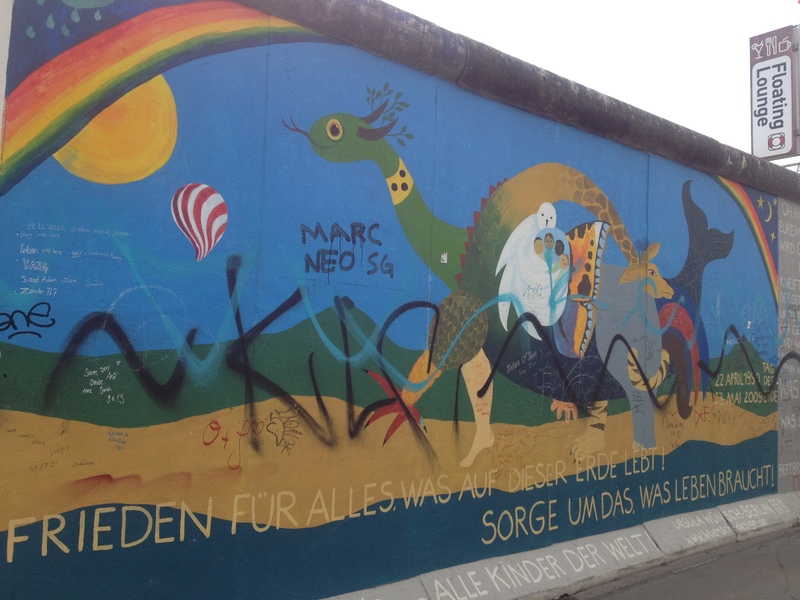 In fact, despite it obviously not being allowed, many sections of the wall had been vandalised, but in a way I feel like it was almost some kind of artistic extension. 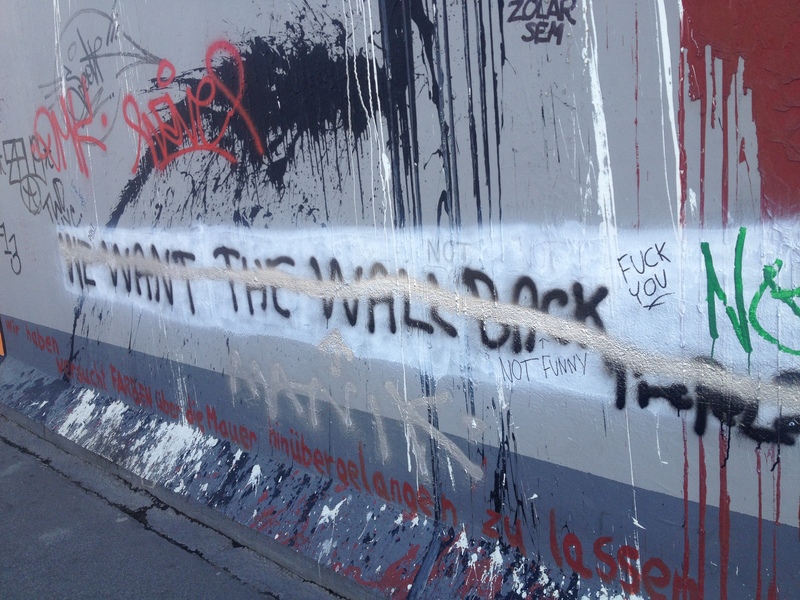 The wall is part of a long history for Berlin and Germany, but the periodic graffiti that marks it almost gives the face of the wall itself a traceable history, a reflection of ideas presented in both an official and unofficial capacity. 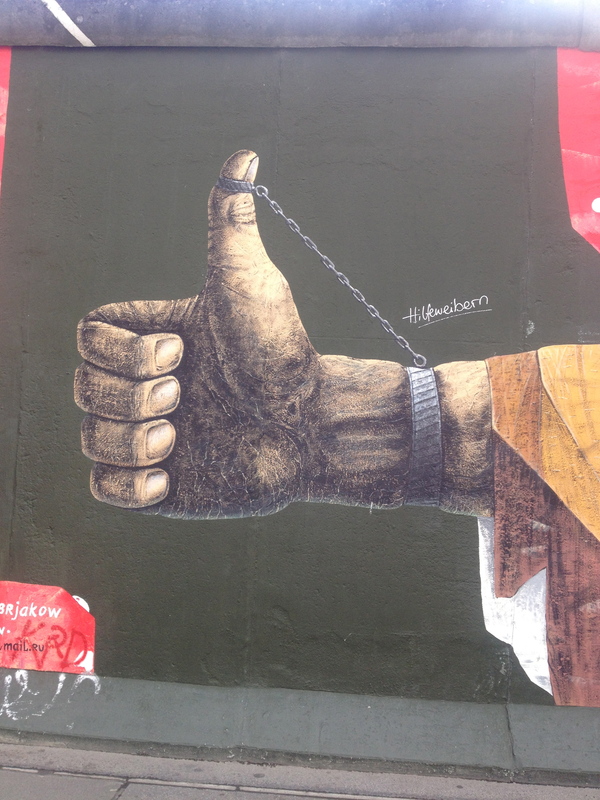 Whether it was the graffiti or the actual murals, the thing I loved about the East Side Gallery is that there is such a strong and powerful meaning behind each and every word and image. 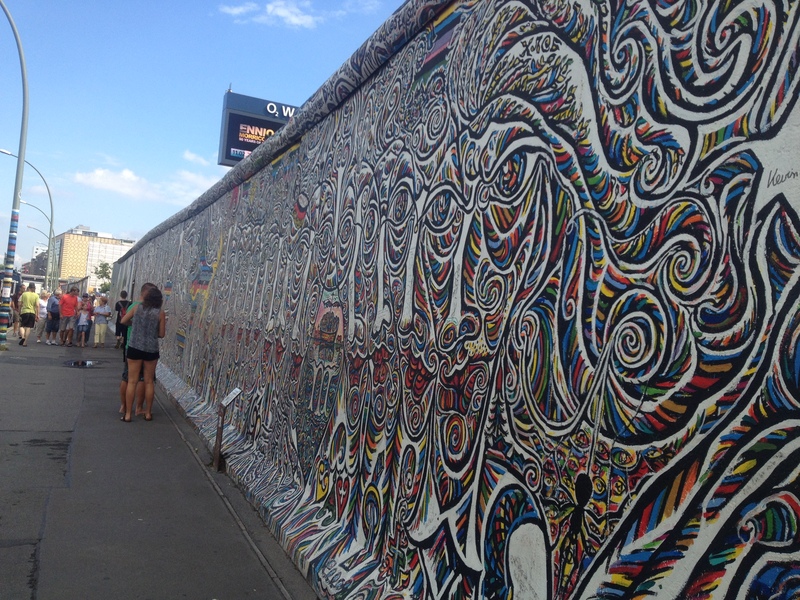 With the wall itself long being a symbol of division and oppression, that’s hardly surprising, but I often found my slow stroll coming to a gradual halt just so I could stand there and look both ways, up and down the wall, and just take it all in. I have no idea what it would have been like here during war time – I couldn’t even begin to imagine – but for me these paintings scratched the surface of the emotions and impacts of the wall that inspired them. It was art and history seamlessly combined into one, and it gave me shivers to behold, something I can’t say for any of the other artworks I’d come across. 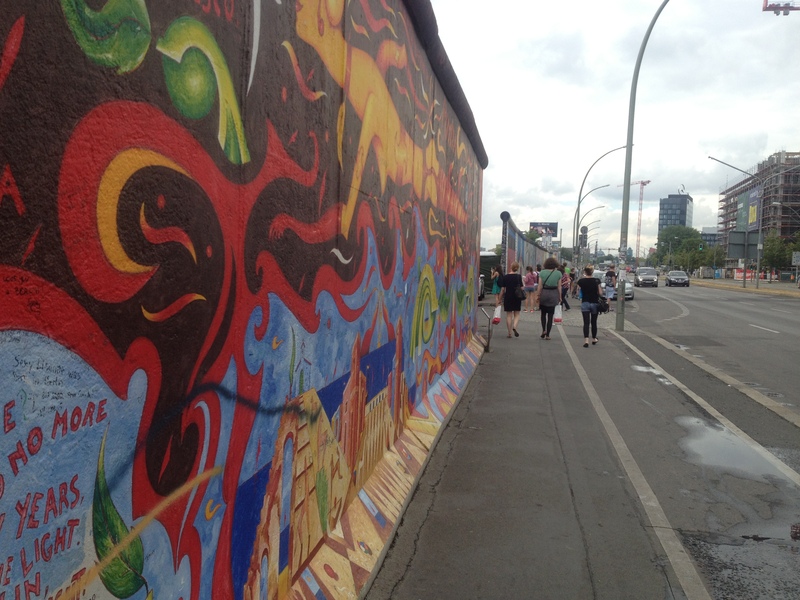 At the start of the East Side Gallery walk. Beginning my walk down the wall. I got excited because I’d been to all of these places – well, almost everywhere. Doves carrying the Brandenburg Gate, an iconic symbol of Berlin. An image that doesn’t need much explaining. A beautiful and intricate rainbow piece. I loved this painting. So simple yet so powerful and suggestive. A colourful mural tainted by graffiti. Even exchanges between graffiti like this I found fascinating, the ever changing face of the wall and the continuing history or perspectives. That’s not to say that all those artworks in the previous galleries didn’t have any meaning – there was plenty of beautiful and moving pieces in all of them. But there’s just something kind of sterile about the museum environment, where things are locked away behind glass cabinets, or sectioned off with velvet ropes. There’s a division between the viewer and the art, and it’s kept pristine and preserved in its slice of history. 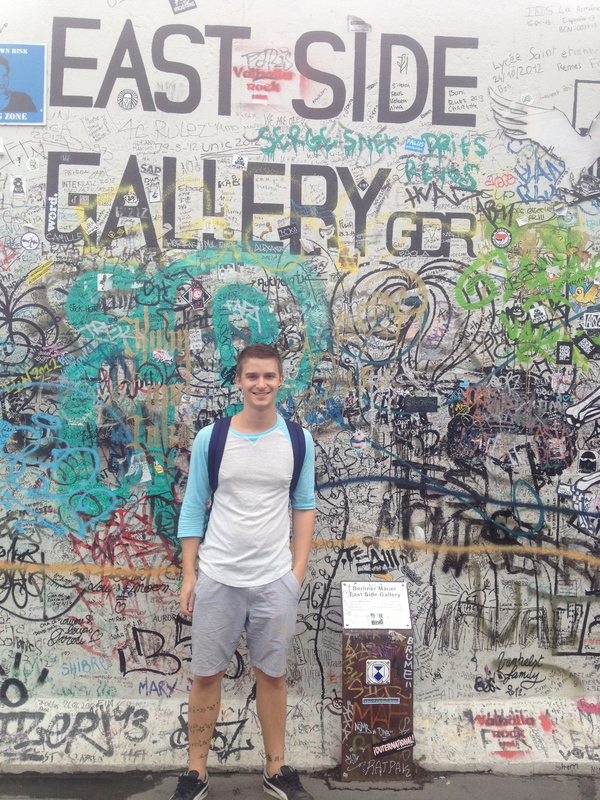 The East Side Gallery at the Berlin Wall had none of that – it was real, it was there in front of you. You could feel it with your hands, and it had moved forward and changed, developing its own history, for better or for worse. It’s not your conventional art gallery, but then I suppose I don’t really like conventional art galleries all that much. 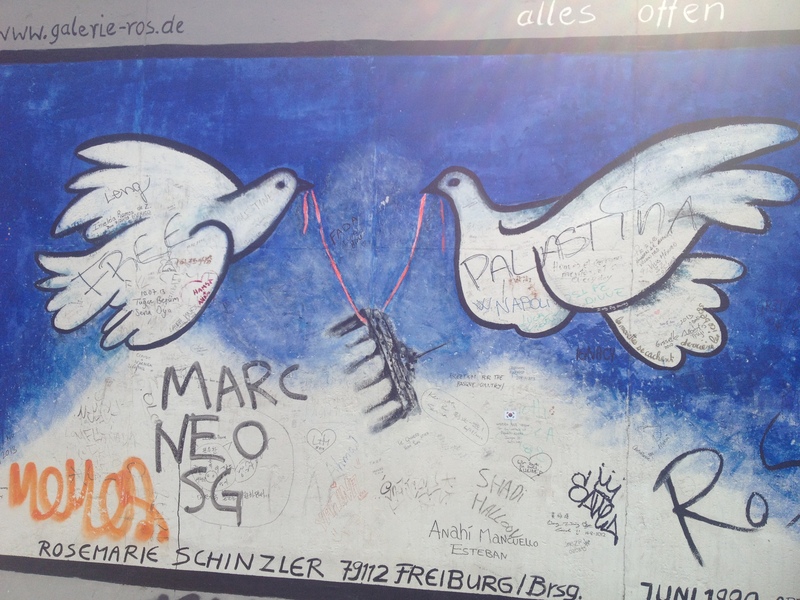 There were plenty of other ones I could have visited while I was in Berlin, but I had found such a sense of fulfilment after seeing the East Side Gallery that I really didn’t see the need. It felt great to be back in Berlin, but there’s a danger in getting too familiar and thinking that you really know the city when you still have so much to learn. Previously in Berlin, I had only bought tickets for the U-Bahn about 50% of the time, rationalising it with the fact that you don’t need them to actually enter the trains or platforms, and I had never seen anyone ever checking for them. I had bought them the couple of times I’d travelled places with Ralf, because I wouldn’t be able to play ‘dumb tourist’ if I was hanging out with a local. But for the times I was out on my own, I took a chance and skipped the ticket machine on my way into the subway. 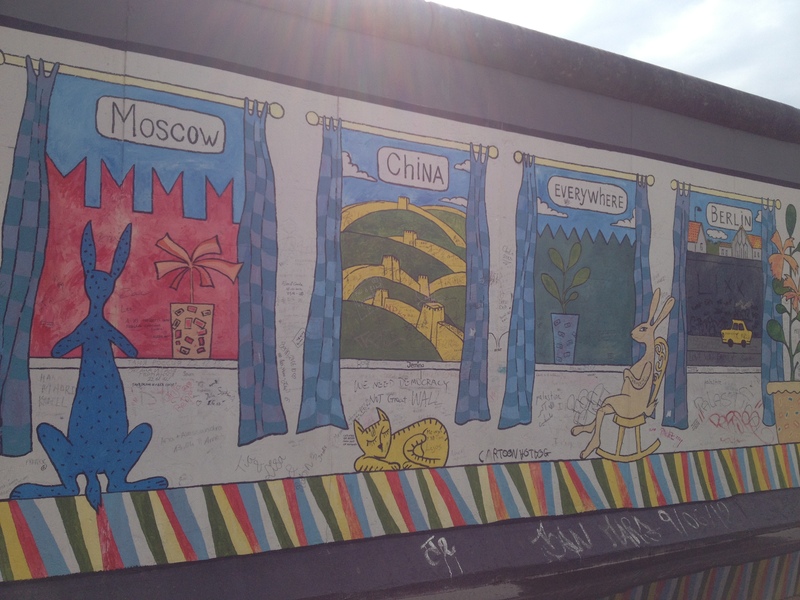 Never really expecting to have it happen, you can imagine my surprise when someone did come around inspecting tickets – of course, on my journey back from the East Side Gallery when I was not in possession of a ticket. I fumbled wildly through my backpack, triple checking my wallet for a ticket that I knew wasn’t there, trying to convince the plain clothed inspector that I had bought one, and I must have lost it somehow. He wasn’t buying any of it. “For not having a valid ticket you will have to purchase an increased fare ticket,” he explained to me, which essentially is a glossed over way of saying you’re going to get a fine. “It’s going to be €40. You can pay for it now, or you have two weeks to pay for it at one of our offices.” I stopped and thought for a second. Yo Bob, got a bunch of what appear to be angry German letters from your letterbox today. Something about not having a ticket. Care to explain? Well I’ll be damned – I certainly got a schooling in German efficiency. They sold the debt on to debt collectors who had also sent me letters. I have to admire their tenacity, as I had never really expected them to send a single letter, let alone a few. In hindsight, it was a reckless disregard for another countries rules and I do feel a little bad about the whole thing now – though not bad enough to pay the fine, which to this day I still haven’t done. But I did learn a lesson from the whole ordeal – from that day on, no matter what country I was in, I made sure I always bought tickets for the public transport. “So what languages do you speak?” was one thing that a lot of people asked me when I was preparing for my trip. There was also a pretty unanimous expression of shock on the faces of everyone who asked when I replied with, “Other than English, none.” The Asian languages in particular would have been a bit of a challenge that would require a mindful application I just didn’t have, but what of the other languages that use the same Latin symbols and letters? I made a rather naive excuse for it, saying “I’m going to be going to so many countries, there’s no way I could learn the languages of every single one of them!” It sounds lazy, I know, but it was the truth – I was rarely in a country for more than a week, and never exactly knowing where I was going to end up next, so never knowing which language I should prioritise in learning. Because they all had their own languages that were dominant, with no major common lingual factor except – yep, you guessed it – English, in one form or another. But the honest truth is that I never went into the trek around Europe expecting the world to cater to what was probably my biggest touristic flaw. I was expecting to have a much more difficult time as a monolingual than I did, and the ease with which I actually did around is a surprise for which I am quite grateful. I often found myself playing charades or using broken English in the most obscure or random places, only to be told, “It’s okay sir, I do speak English.” It was slightly humiliating, but it was the one thing I couldn’t escape or distance myself from, or make any immediate move to change that would be directly helpful – by the time I learnt the basics of any language it would be time to move on to the next country! Still, it wasn’t always smooth sailing, and Europe provided me with more than a handful of awkward and memorable linguistic experiences. The Russian and Mongolian languages and their Cyrillic alphabet did inspire a bit of my fascination with other languages, but for the most part, everyone in Russia and Mongolia spoke Russian or Mongolian, and not much else. It was when I got to Finland that the concept of widespread multilingualism really hit me. I watched on, slightly intimidated, as Susanna’s Finnish friends seamlessly moved between Finnish, Swedish – the countries two official languages – and English, which everyone just seems to know anyway despite it not being an official language. Scandinavia and northern Europe were like that, I was told from the beginning – almost everyone learns English in school, so I should have no problems. Yet I was still exposed to what felt like at least three different languages in each country. It actually made me feel a little less intelligent, to see small children yapping away in a foreign language and switch over to what was an impressive command of rudimentary English, especially for a 5 year old, and back again as though it was nothing. In an attempt to make more excuses, I told myself it was the geography and logistics of Europe than lent its residents to learning so many languages. They have many neighbours in close, bordering proximity, with everyday practical uses for the languages they were learning, and a constant need to practice them. How often were my Year 7 French lessons going to come in handy in the middle of Sydney? 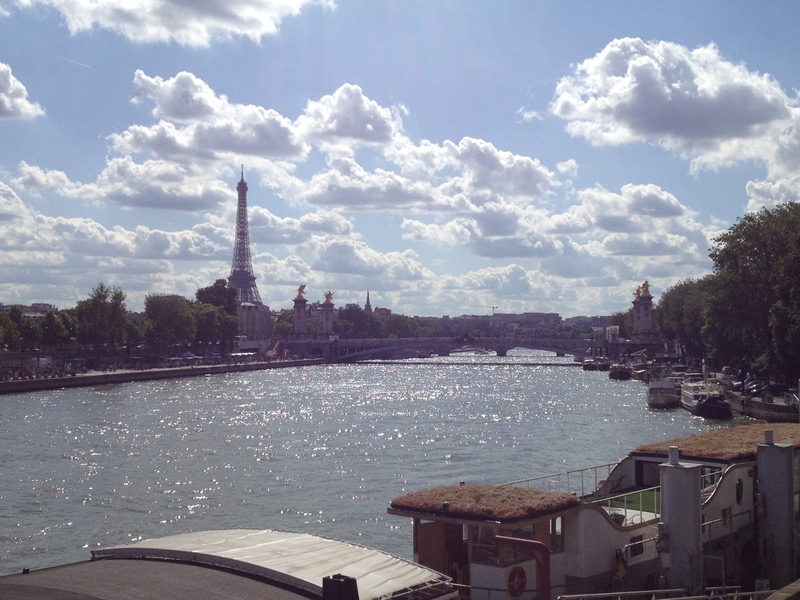 Although I shouldn’t speak so soon – the country where I did encounter my first language barrier was, of course, France. “The French are so arrogant – they’ll understand English, and know you don’t speak French, but they’ll pretend they don’t know what you’re saying because they think it’s beneath them to speak your language in their country.” That was the general idea a lot of people had told me to expect in France, particularly Paris, but I’m so pleased to say that it was not my experience at all. A lot of the guys I was with for Parisian Pride spoke amongst themselves in French, but when they addressed me they always spoke in English, or at least to the best of their abilities. Which was more than I was doing for them, considering I was in their country, so I feeling nothing but gratitude towards the Parisians I encountered. Well, perhaps a little more than gratitude… whatever language they spoke, Parisian men were still Parisian men. However, during my frantic last morning at the hostel in Paris, packing before my 12pm check-out time, I was accosted by one of the housekeeping staff. She seemed a little flustered when she entered the room and saw me doubled over my backpack, trying to shove everything inside as quickly as I could. I probably looked like a deer in the headlights too, and we both just stared at each other for a few seconds. Then she started speaking to me in French. “Oh… ah… sorry. I don’t speak French,” I said sheepishly. However, she continued motioning to my bed and speaking to me in the foreign tongue. “Ahh… Check out is at noon? I still have fifteen minutes?” I said, pointing to the clock. She said something else in French, with some emphatic hand gestures, and stared earnestly at me. Given that northern Europe was better known for the English skills of its residents, it’s no surprise that Spain was the next country to present me with a language barrier, although this time it was an entirely different situation. I learnt a fair bit of Spanish before a trip I took to Costa Rica a couple of years ago, and even studied it for a semester at university afterwards. Despite all that, the only phrases I had mastered allowed me to tell people I speak Spanish, just not very well, and to order a beer – priorities, right? It wasn’t much, and it really wasn’t enough when I tried to make conversation after locking lips with a guy on the dance floor at a nightclub in Madrid. He spoke about as much English as I did Spanish, or even less, so I basically had to stand there with a blank stare until he finally said something that I even half recognised. Not that he was saying much, other than “guapo“, between our kisses, though. I guess there are some situations where body language really does suffice. Yet the country does have some other linguistic tensions that are a little bit more important than a Spanish one night stand. When I was in Barcelona I thought my Spanish was just exceptionally poor, but it turns out that in the region of Catalonia, almost everything is written in Catalan, and a lot of the locals get annoyed when you ignorantly launch into speaking to them in Spanish, regardless of your fluency. It meant little and less for me, someone who could hardly speak either, but for a Spanish speaker like Rich it was quite frustrating. 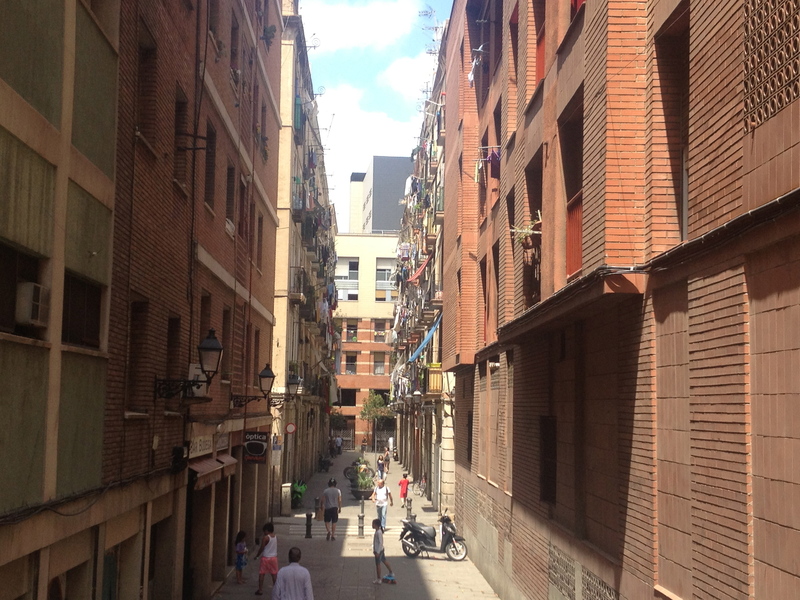 But probably not as frustrating as it was to all the local Catalonians who everyone just assumes speak Spanish. I was able to discreetly bow out of that internal national conflict, as my reliance on English wasn’t as likely to offend anyone as much as it would just make them think I was an ignorant tourist. The way I was able to explore Europe despite only knowing one language does give you an idea of the kind of power that fluency in English can offer you. Some people even find the language rather intimidating. I remember talking about it with Ike when I was staying with him in Ancona. Ike is half Dutch, so he spoke English and Italian as well as a bit of Dutch, but he told me of his own interesting experiences with language in Spain. 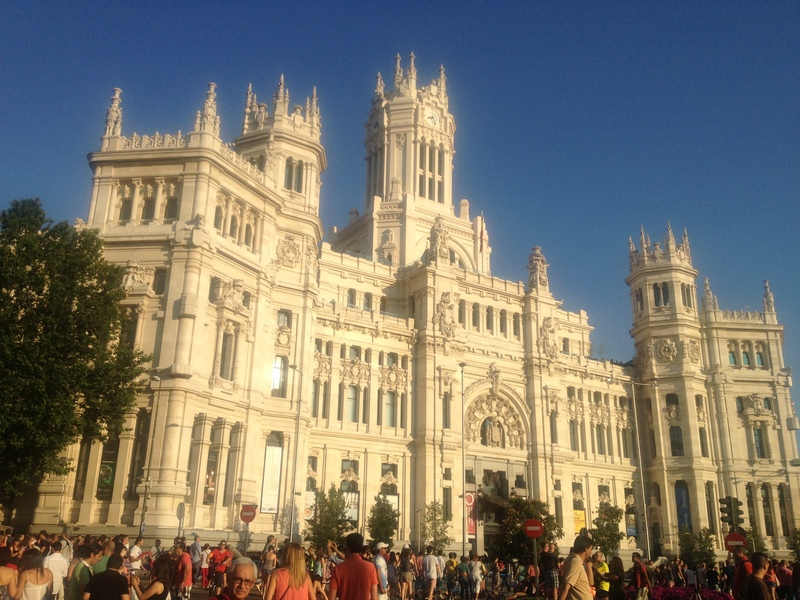 “It’s interesting – people are almost afraid of speaking English incorrectly, especially a lot of younger guys”, he mused as I told him my own experiences in Madrid. “I mean, they won’t get better if they don’t practice, but they don’t want to speak it if they can’t speak it perfectly. It doesn’t really make sense. A lot of the guys, they would rather try and speak to me in Italian.” He had a good chuckle remember thing that. “And… I mean, they don’t even know Italian. There’s some small similarities between Spanish and Italian… but, you know, not enough. They’re rather speak to me in terrible Italian than use slightly imperfect English.” It was something that I never came across – most likely because English was the only option they really had when talking to me – and it’s something I still haven’t been able to really explain. Spain and Catalonia aren’t the only regions to have geo-lingusitic tensions. On my first night in Vienna with Kathi, she had explained to me some of the differences between the dialects of German that are spoken in Austria and Germany. “It’s mostly the same, but there are some different words for things that we have that the Germans don’t.” The more she explained it, the more I realised it was much the same as differences between American English and British English and even Australian English. At first it doesn’t seem like much, but you when you think about the different meanings we assign to different words – the use of “thongs” springs to mind – you understand just how much confusion there can be with these slight differences within the language. “It’s also frustrating when we go to Germany,” Kathi continued, “because most of the people in Austria take the time to learn some of the differences in the German they speak in Germany, but not many Germans do they same when they come to Austria.” She sighed and rolled her eyes. “It’s like they think they’re the ones who speak real German.” I couldn’t help but giggle to myself a little. It was interesting to see that such little problems could be, quite literally, the same in any language. Yet there were other times when the different language posed absolutely no problems at all, and appeared to exist side by side with the greatest ease. When I arrived in Prague and was sitting down in Tomas and Matej’s kitchen eating the dinner they made me, the two often had short, lively exchanges in another language. When I asked Tomas what language they were speaking, Tomas seemed like he had to pause and think about it for a minute. “Well… I am speaking Czech, and Matej is speaking Slovak.” Tomas was originally from the Czech Republic, while Matej was a native of the neighbouring Slovakia. “So… the languages are the same?” It was confusing, and seemed like literally the opposite of the kind of thing that Kathi had been talking about with the German language – instead of one language that everyone had trouble understanding, this seemed to be two languages operating like one. “No, not the same,” Tomas said, thinking more. “They’re just… similar. I can speak Czech, and understand Slovak. Matej can speak Slovak, so we can just speak either.” He shrugged, not thinking much of it, but I found the concept rather mind-blowing: that you could speak in one language and listen to someone else speak in another. It was almost more than my poor little monolingual brain could handle. Considering they both used to be part of Czechoslovakia, I can only assume that the languages must be very similar, but even still, I was slightly amazed. While I was impressed with the way the two languages operated so smoothly in sync, Prague was probably the least English-friendly city that I visited in the whole of Europe. Buying a bus ticket in the corner store proved to be a bit of a mission – Tomas had been having a cigarette outside, but I had to call him in to help me when I realised the woman behind the counter didn’t speak a lick of English. After that, I just had to hang on to my old tickets to show her the one I wanted whenever I went to buy a new one. There was enough English to get by in the main touristic parts of town, but I was lucky I usually had Matej or Tomas around whenever I was in the more obscure parts of town, because something tells me I wouldn’t have fared so well there as I had in the rest of Europe. 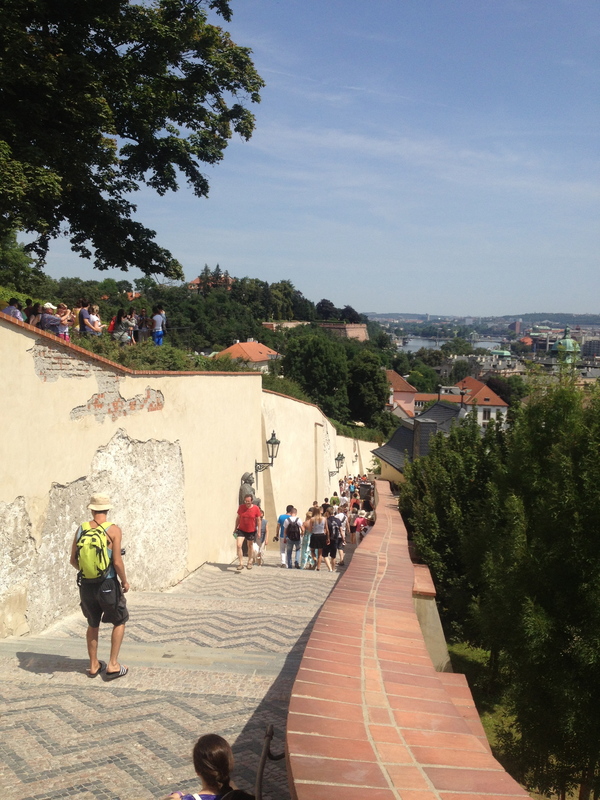 Even sitting down to chat with their neighbours in their award-winning backyard was a bit of a challenge – out of all the places I’d visited, Prague was the city where learning to speak English hardly seemed like a priority at all. Tomas had only learnt it because he had lived in San Francisco several years ago, but he was definitely in a minority of those who did speak English. I am so lucky that the one language that I do speak afforded me so much opportunity to travel relatively unhindered, but the more I saw of the world, the more my status as a monolingual felt like a handicap. I was insanely jealous as I watched people slip between different tongues so easily – I knew they weren’t saying anything specifically more profound than anything that could have been said in English, but it just felt like there was a wealth of knowledge that I was missing out on. Living in a country like Australia, with no countries with direct borders and no extremely obvious choices of a language to learn that might be useful in your own city, I’d never really considered that learning another language would be such a beneficial skill. Now, after travelling around so many different countries and discovering the complexities of a range and huge variety of languages, it’s become another one of my goals to learn, practice, and eventually become fluent in another language. Which language – for now – is undecided, but I have to thank the many companions and friends I made along the way in Europe for inspiring me, and opening my eyes to the importance of languages, and the highly valuable skill of multilingualism. 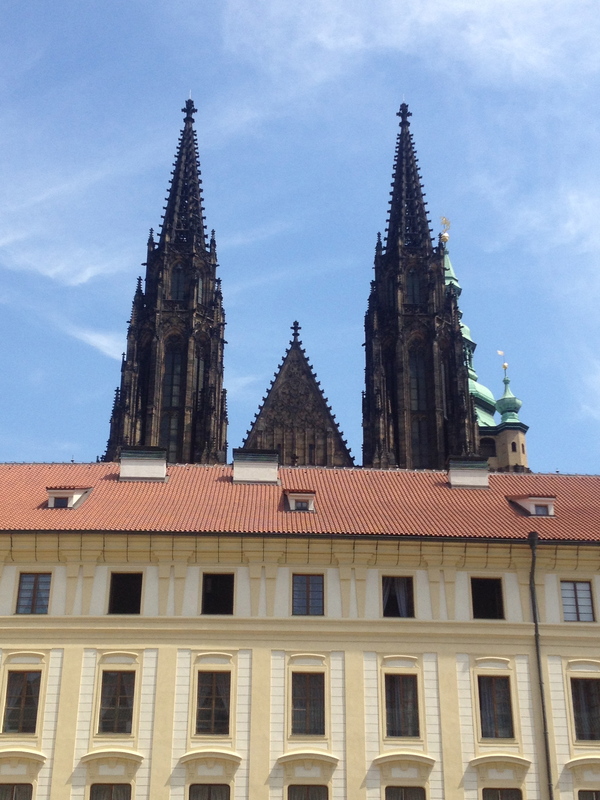 I’m not going to lie – of all the major touristic attractions that I had known about, heard about and made plans to visit, the thought of going to Prague Castle made me unexplainably excited. I’d heard so many things about Prague being such a beautiful city, and the thought of a castle on a hill that overlooked the city inspired foolish, romantic notions of fairytale settings and wonder and magic. Of course, realistically I know it was just going to be a castle, but I let part of myself get swept up by the fantasy daydream. The following morning both Tomas and Matej had to leave for work, so they left me to my own devices to explore the city, with nothing but a key so I could come and go as I please. And a fair bit of advice, of course, as to which buses to catch to get where, and what things I might like to see. “If it’s your first time in Prague, I assume you want to go to the castle,” Tomas had said as he’d told me all this before he’d headed out the door. He’d been right. So I set out on the bright and sunny morning to catch a tram that would take me across the river and up the hill to the castle. As we got closer, it became harder to see the castle, as we drove through areas of greenery and it became a lot harder to look up from inside the tram windows. The line map on the top of the tram car had a little picture of a castle next to the stop that you were supposed to get off at to visit it, but… it was sort of in between two stops. I wasn’t sure which one to pick. My Lonely Planet guide was no help. There were no obvious English speakers that I could ask, and no one seemed friendly enough to approach. Oh well – in the end I just followed a bunch of other tourists who seemed to be on some kind of tour. When I got off the tram, my surroundings were slightly off-putting. It was like a ghost town – other than the group that had gotten off with me and were wandering slowly away, there was not a soul in sight. But I was left standing in the hot and heavy sun, in a cobblestone area that looked like a set from a Shrek movie (except it was obviously real, not an animation), making me feel like I was in a deserted theme park more than anything. Was I already inside the castle complex? Was this just some random town, or village? I was so confused, but in the distance down one main road, I could see the spires of the castle emerging above the closer rooftops. 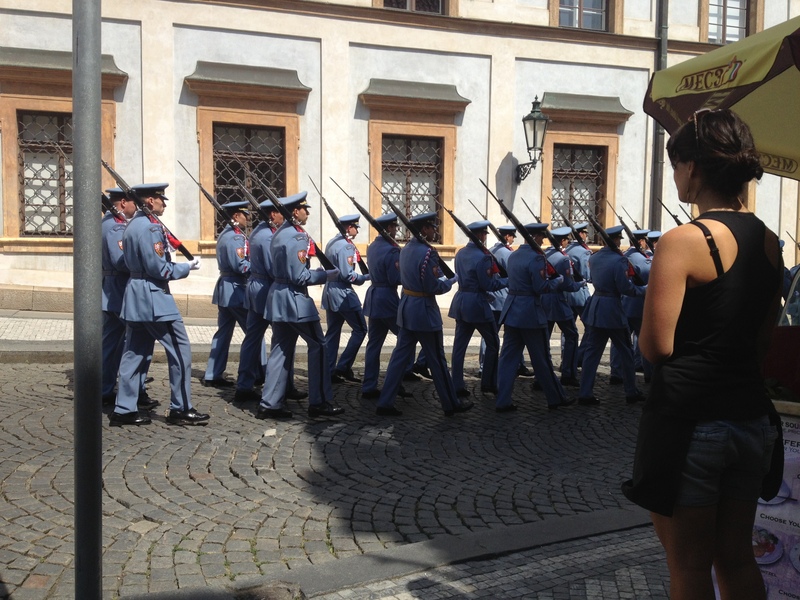 I set my course towards them, and made it just in time to see the final procession of the changing of the guards, not unlike the display I had seen in the Old Town of Stockholm in Sweden. As they marched off down in the direction I had came from, I turned to the main gate of the castle grounds. It was topped with intricate golden metal framework and statues of men that appeared to be in various stages of combat. The picture was, of course, completed by the tourists doing typical tourist things such as taking photos with the stern, solemn looking guards at their posts at the castle grounds entry. I chuckled and took a few photos of the gate itself before wandering into the grounds. The guards walking away after the ceremonial changing. 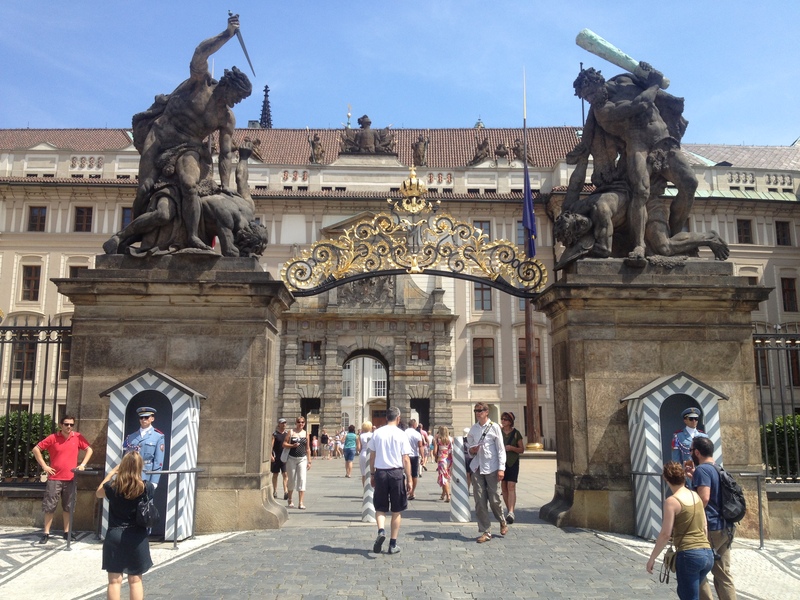 The gate that served as the entry into Prague Castle grounds. As I began wandering through the courtyards, I realised that the castle itself was not one huge ancient building, the the greater limits of an area that included a few large churches and palaces. I wandered through the first courtyards looking for my way into these said palaces – I could see the spires pointing up into the sky above the buildings immediately in front of me, but it was like a maze to get through everything. 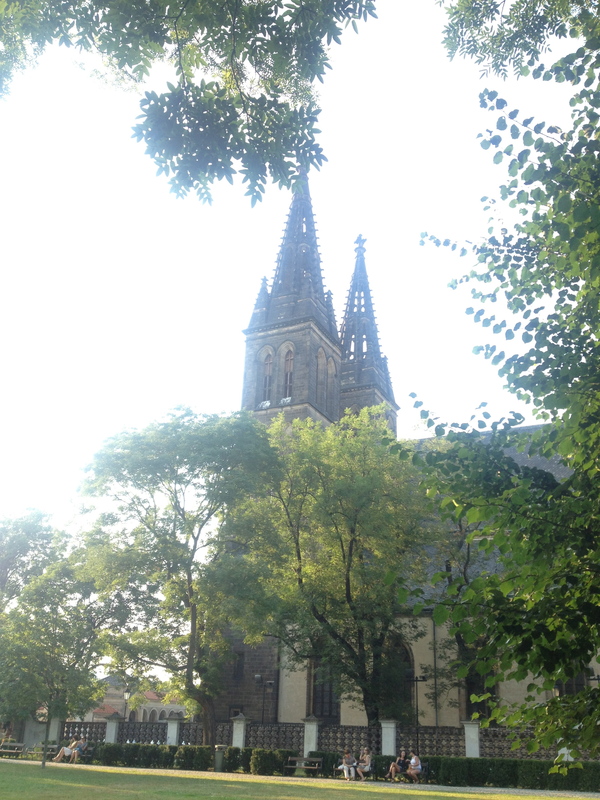 The spires of the chruch taunting me – just out of sight… sort of. How anyone actually gets a good picture of this thing is beyond me. When I finally made it to the churches, there were some guide ropes set up, as though there was some kind of line to get inside, but there was no one lining up so I simply walked on through and into the building. 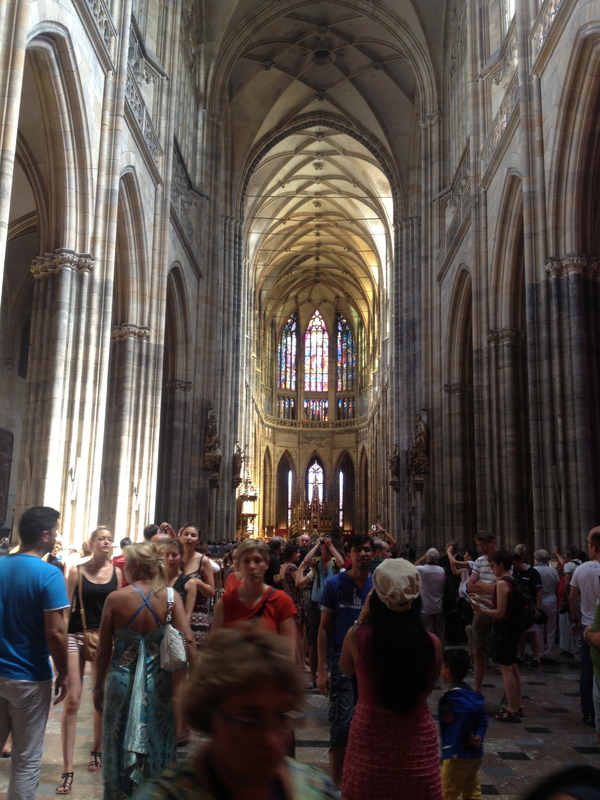 I had just entered into the halls of the St Vitus Cathedral, and was gazing upon the St Wenceslas Chapel. The echoing chamber was full of people, but the chapel itself was beautifully lit up by the sunlight pouring in through the windows. However, while it was gorgeous, it was just another church, so I headed back outside after taking a quick look around. 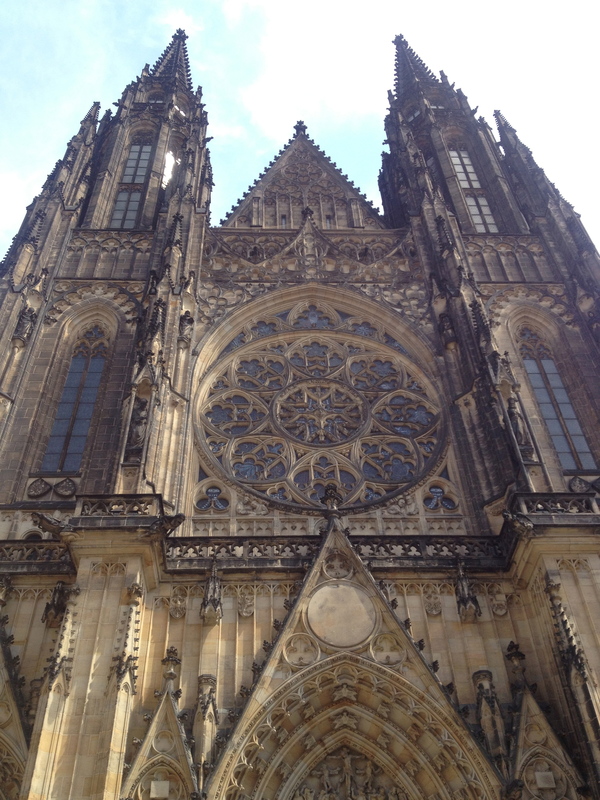 The front view of St Vitus Cathedral. Inside the St Wenceslas Chapel. I doubled back the way I came until I came to a ticket office – wait, tickets? Yep, while wandering the castles courtyards and gardens were free, apparently you needed tickets to enter into each of the main attractions… including the St Vitus Cathedral. I wasn’t about to pay to visit it again, and they had weird ticket packages and bundles that had different validity dates for certain things, and it all just seemed too confusing. I had managed to sneak into the first church undetected, so I figured I would move ahead and see if there was any way around the entry fee to see some of the others. I never ended up even finding the Vladislav Hall in the Old Royal Palace, but I did come across the Basilica of St George. However, it was a much smaller building than the first cathedral, with one entrance where someone was collecting tickets. I pressed ahead, figuring I could return later with a ticket if I so desired. Courtyard in front of the Basilica of St George. 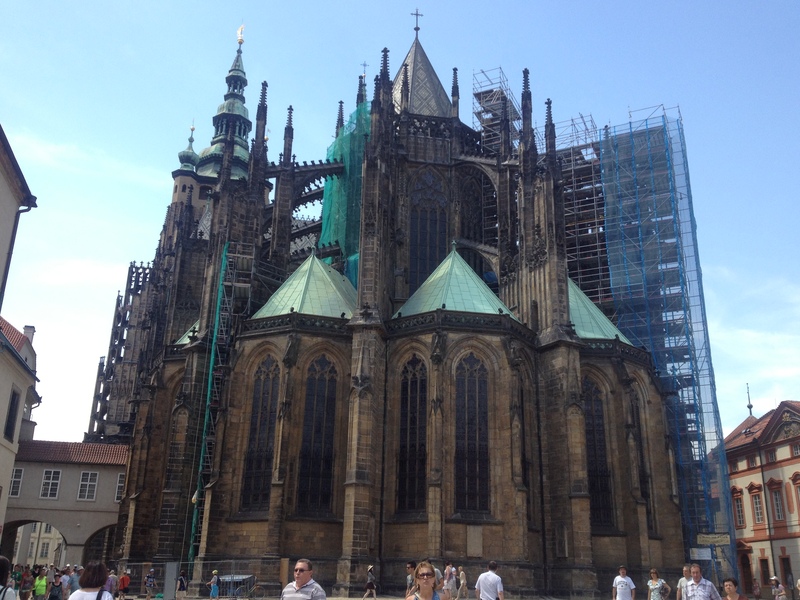 Side view of St Vitus Cathedral, complete with scaffolding. There were a lot of beautiful courtyards and minor buildings throughout the castle grounds, and when I reached the edge wall there was a view that stretched into the horizon, the view from the castle of the old kingdom below. 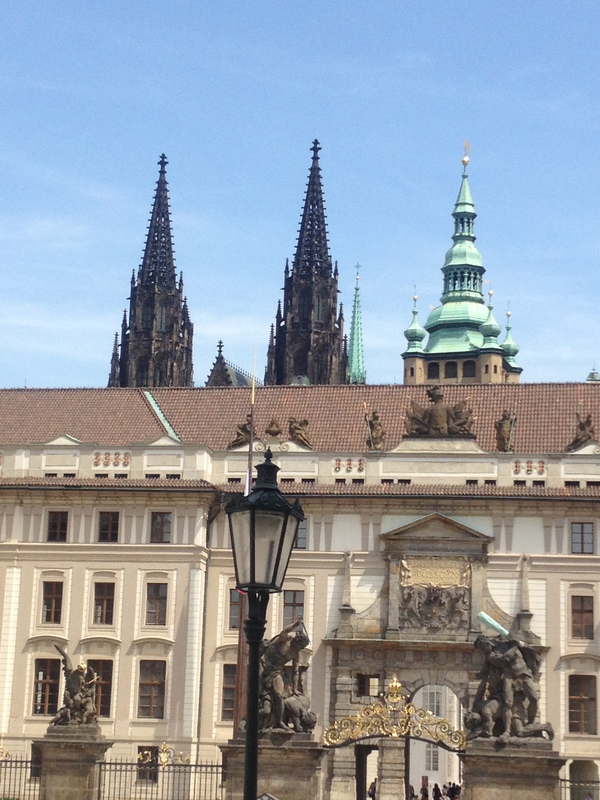 However, in the end I found the whole of Prague Castle to be an underwhelming disappointment. Yes, it holds the Guinness World Record as the largest ancient castle in the world, and it is the official residence of the President of the Czech Republic. Yes, the Bohemian Crown Jewels are there, but they’re kept in a secret, hidden room, and I didn’t catch a glimpse of them. In the end it was just another set of churches to look inside, and unlike most of the churches I’d seen in my travels, like the ones in Cologne, Rome and Zürich, you had to pay to get inside all of these. After swearing that I had seen enough churches to last me this journey, it was a little more than I was prepared to do. So I followed the stepped walkway that led to Prague Castles exit, and crossed the Vltava River and headed back to Old Town Prague. 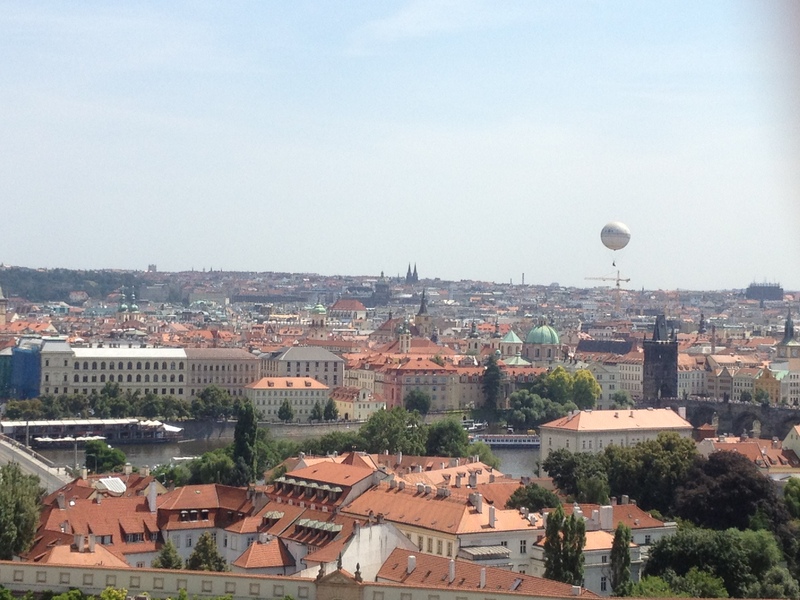 View from the castle grounds over Prague. 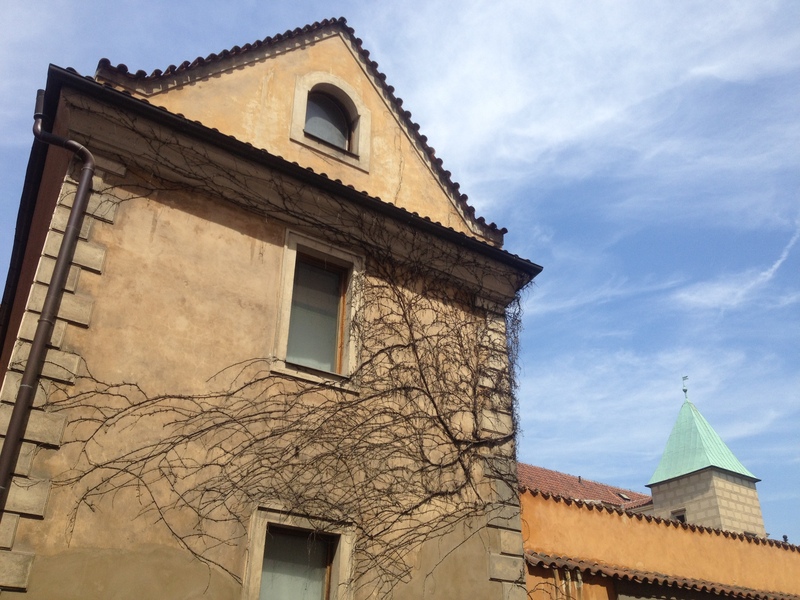 Even the exterior of some of the random building around the castle grounds were particularly beautiful and enchanting. Steps leading down to the exit of the castle tour. Truth be told, even though the castle ended up being a bit of a let down for me, I still took immense pleasure in wandering the streets and enjoying the ancient and natural beauty that resonated throughout Prague. The castle was a nice aesthetic touch, visible across the river in the distance, but there was no need to actually visit it to get that fairytale feeling. The next day was something a little bit different. Tomas was a landscape architect, and when I arrived on Tuesday he had told me that on Thursday they were going to get a visit from the mayor of Prague. The apartment complex in which they live had had a garden that was ugly and dying, not good for anything, so Tomas had taken it upon himself to put in hours and hours of hard work to restore the garden, complete with spaces for children in the complex to play, for people to plant gardens and vegetables, and a general sitting area for anything from an outdoor feast or picnic to catching up with a neighbour over a cigarette. Somehow, their garden had been entered into a competition, and unsurprisingly, had won. “There’s going to be a TV crew and everything,” Tomas had told me about the mayors visit. “They’re probably going to interview me too.” I could tell he was excited about the whole thing, but a little nervous about being on TV. Matej had been busy preparing food the day before, and that morning there were a bunch of official looking people, camera crews, TV hosts, as well as all the neighbours out in the garden. I watched on by the table of food, not really understanding any of what was being said, but feeling a little special to catch an inside glimpse into what was probably a special event for a lot of them, but what was for me as authentic an experience as I might get in everyday life in Prague. Or maybe that’s selling my time in the city short. It was an interesting and non-touristic experience, but I also spent a lot of my time in Prague just hanging out with Matej and Tomas, eating local food at their local favourite places, walking around the beautiful city, or hanging out at night and watching movies, with them introducing me to some strange Czech ones as well as sharing their favourite Hollywood films – Death Becomes Her was a hit all around. I just only just now started to feel fully recovered after my excessive Pride binging in Southern Europe, and I realised it had been roughly two weeks since I had done any kind of crazy partying – extremely uncharacteristic of me – but I was rather enjoying the break, and it had given me the time to fully regain my strength. I did spend one afternoon with Tomas and his friend Ondra having a stroll through a lush green garden area. I was amazed at the luck I had been having with the weather, and the daylight had been coming long and strong for weeks now. Beer was free flowing in most parts of Prague – you could could get it in plastic cups to go from many places, much like the set up for Pride in Paris, and so the three of us got our big cups of beer and took them outside to enjoy them on the grass. Ondra was a little quirky, but still a nice guy. He only spoke in English half the time, the other half in Czech, which made him a little mysterious to me, but I think Tomas explained it as that his English just wasn’t that good. Or he just didn’t like speaking English, whatever. But the three of us managed to have some funny conversations, with Tomas a relaying translator, having a couple of deep and meaningful discussions as well as laughing at the random and silly things we observed in the park around us. Tomas also took me over to a nearby church at the park. It was open, and free to all, but photography was prohibited. Inside, there was a case that contained some ancient relics, including bones and artefacts that belonged to saints from centuries past. It was a cool little thing to glimpse, and the church was virtually empty – a sign that I had definitely diverted from the tourist path and off the beaten track. The smaller church Tomas took me to that afternoon. The view of the church from our comfy spot on the grass. I’d enjoyed my very brief time in Prague, and once again it was a little upsetting to have to leave behind people who I had just met, yet had grown so close to in such a short amount of time. “Don’t worry,” I had assured them as I had packed my stuff up on my final night. “I’m breezing through Europe so quickly this time, it just means that I’ll definitely have to come back one time to do it all probably.” They seemed to like that, although they were such nice guys that I’m sure they’d find plenty of new and fun Couchsurfers to fill my place when I left. But I was glad that once again I had taken the opportunity to Couchsurf and meet some amazing people and see some pretty cool and interesting things. 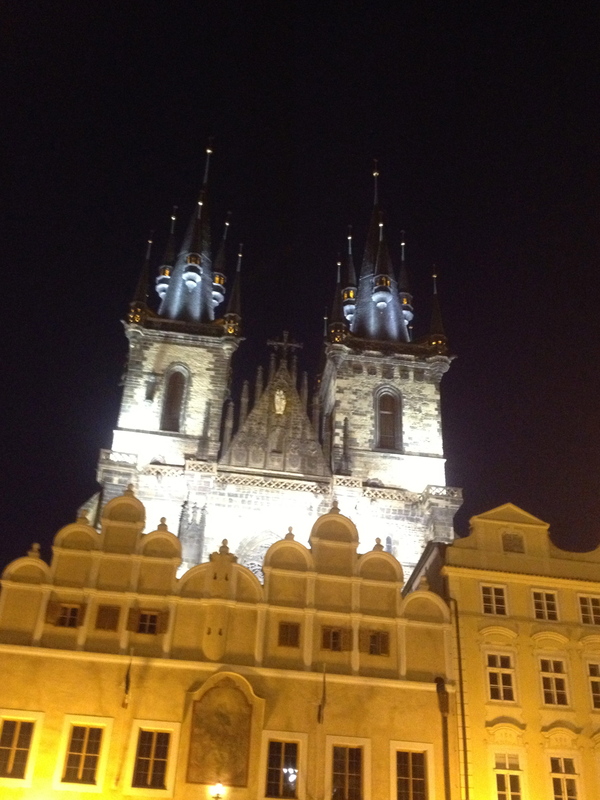 But for now, my time in Prague was at an end. I headed back to the train station on Friday morning, and when I saw the crowds I felt a moment of panic, having not reserved a ticket in advance. But there was just enough room on the train, luckily. I couldn’t really blame everyone for wanting to go where I was headed, because as I boarded the train I was overwhelmed with anticipation and excitement. 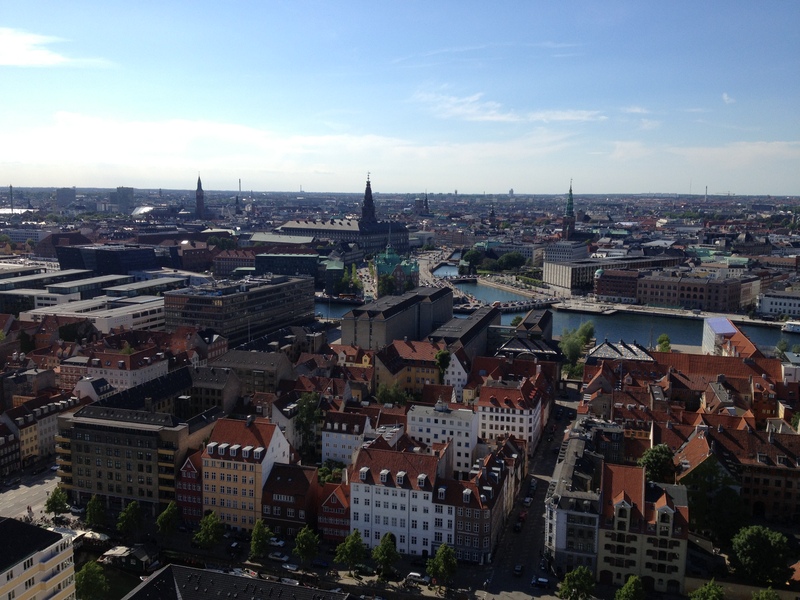 I’d tried my best to see as much as I could during my time in Europe, and while you would think that that wouldn’t involve visiting a city for the second time, there was just something about the allure I felt that I hadn’t quite managed to shake: I was heading back to Berlin. After saying goodbye to Itzel and alighting at Praha-hlavní nádraží, the main train station of Prague, I set out to navigate the public transport system of the capital of the Czech Republic. 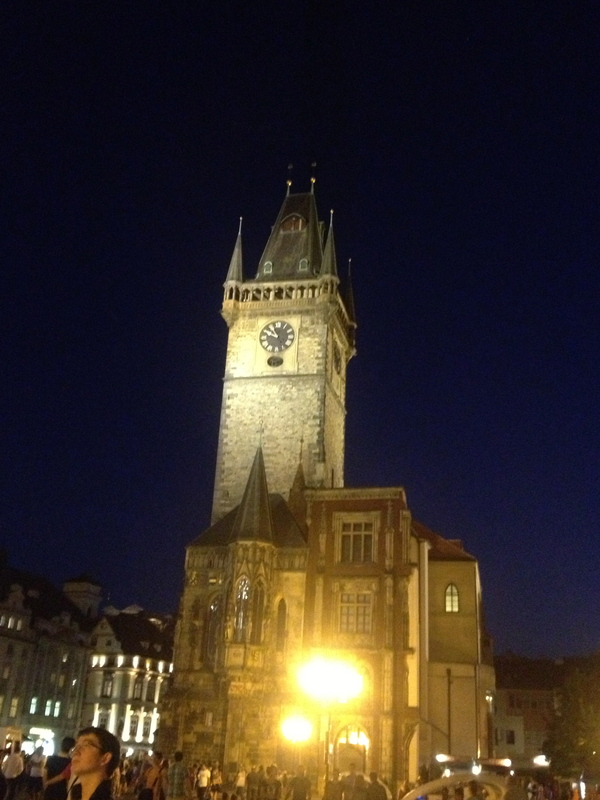 It was so close to 5 o’clock by the time I arrived in Prague that I didn’t even have to wait around at all – another perk of my detour was that I had done all my waiting either on the train, or in Bratislava. But first I did have to withdraw some crowns, the local currency, and then find somewhere to spend the large value notes in order to get change when I realised none of the metro ticket machines would accept them. There was also the strange requirement that I had to buy an extension for my luggage on top of my regular ticket, presumably because it would take up more room that could potentially fit another passenger. There was also a similar ticket for taking dogs on the metro, but in the end I had to forgo this extension and just buy a regular ticket simply because I didn’t have enough change to get the right one that I needed. “They rarely check for tickets on the metro in Prague,” Itzel had told me. “But they’re not really that expensive either, so you might as well buy it.” I did the best I could with what I had, and hoped that I could bluff my way out of any encountered trouble with excuses of being a tourist. I followed the directions that my hosts had given me, though it was still very confusing. There were so many buses going on different routes and in different directions that all left from the same stop, and there was an uncomfortably lack of anyone who spoke English to help me out. But I persevered, and in the end I caught the right bus and followed the little blue dot on my iPhone GPS until I finally made it to my new home. Tomas and his boyfriend Matej’s house was right near the bus stop, and thankfully they were home by the time I finally arrived. Tomas had told me that I would be the first guest that the couple had hosted via Couchsurfing. I’m not sure if they were excited or nervous, but they warmly welcomed me into their home, a gorgeous little flat in a beautiful part of town. They had made me some dinner, too – I couldn’t tell you exactly what it was, but it was a homemade meat dish with some vegetables and it was a traditional Czech recipe and it was absolutely delicious – just what I had needed after a long day of travelling. I also noticed the distinct use of dill in the cooking, and I smiled to myself and remembered my time in Russia, and in my head I could still hear Marti saying “Isn’t this dill-icious?” I guess that’s how I knew I was back in Eastern Europe. We sat around their kitchen for a little while, chatting and getting to know each other, and then Tomas asked if I felt like going out and seeing some of the city. After a day of doing nothing but watch the Eastern European countryside pass me by, I was keen to get out and about, so I showered and got changed and the three of us headed back into the city centre. Tomas was probably one of the best hosts I could have asked for during my stay in Prague – he was incredibly knowledgeable of his city, and was always pointing out the smallest and most random things, yet had some interesting story or weird fact about each and every thing. Some things were history lessons, while others were more modern facts, or even urban street smart tips. “Don’t come here at night, it’s a little dangerous,” he had said as we passed a park area on the bus. “There are drugs. Drug dealing, things like that.” Then he shrugged his shoulders with a smile. “Unless you are looking for that kind of thing.” Our first stop that evening was down by the river, where there was some kind of small outdoor performance on, with a band playing live music and a temporary bar set up selling some local Czech beer. Tomas bought us a few beers and we listened to the music and talked more about Prague, and my previous and future travels. Most of my European hosts seemed a lot more interested about Australia though – I’d been gone for so long that even I started to forget that I was actually a foreigner from half a world away. Out on the water, the river was filled with paddle boats, some of them in the shape of swans, slowly gliding along in the warm afternoon sunlight. The further north I travelled, the longer the daylight hours were becoming, and I loved it. From there we walked back along the river, Tomas pointing out different architectural features of different buildings until we finally wandered up to the Old Town historical centre. Where the riverside pop-up bar had been a more underground affair, I could tell that we had wandered into the prime tourist zone of Prague as soon as we arrive. 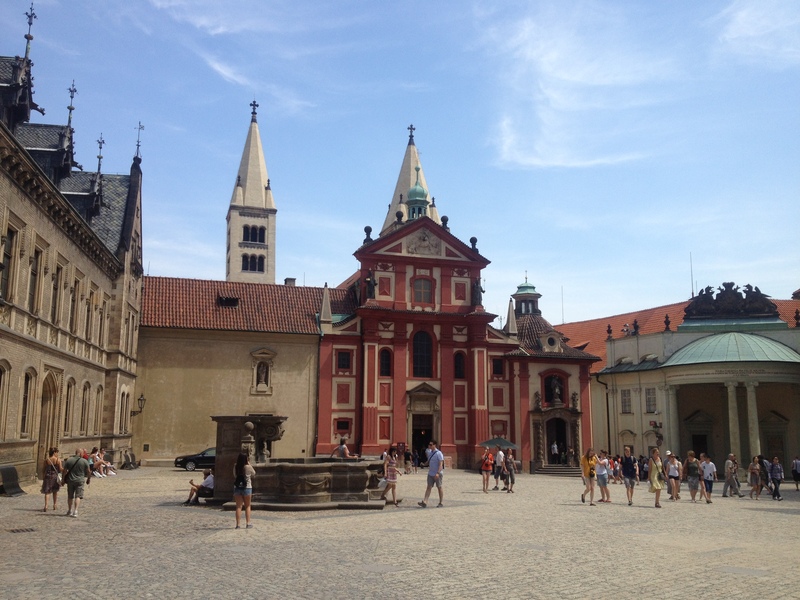 It was a beautiful area though, with the main square surrounded by small Gothic churches and cathedrals. I say ‘small’ in comparison to some of the larger churches I’d seen in Madrid and Rome, but they did manage to tower above the cobblestone pavements of Staroměstské náměstí, letting the small city hold its own and even stand out as one of the more beautiful places I had visited so far. The other major feature of the Old Town Square was the Old Town Hall, or more specifically, the astronomical clock on the bell tower. “It’s very popular with tourists,” Matej said, indicating the throng of people that was amassing at the base of the tower. “Yes, every hour there is this… show… display…” At first it just seemed like Tomas couldn’t find the right word in English to explain what he was trying to say, but later I would realise he was just uncomfortable at using any of those words to even try and explain what we were about to witness. St Nicholas Church, eerily illuminated by the lights of Old Town Square. 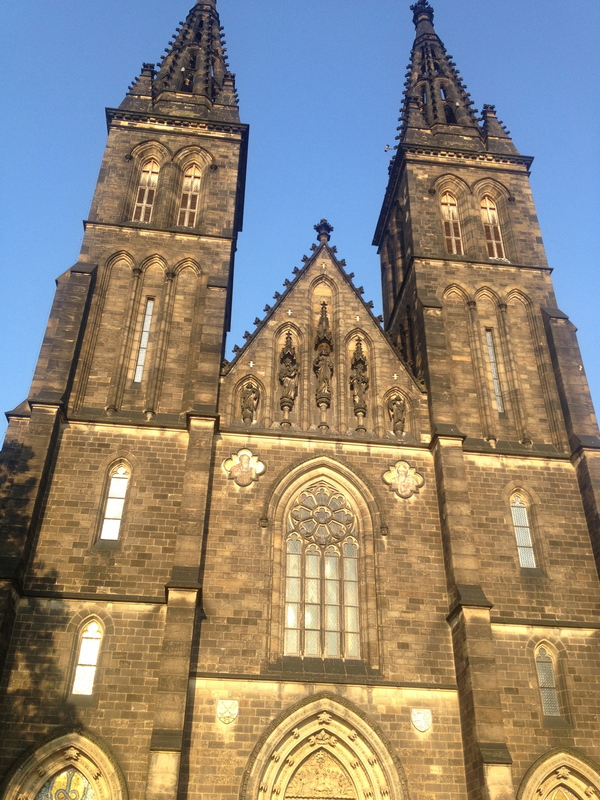 The twin steeples of the Týn Church, built in 1365. The clock tower of the Old Town Hall as seen at night. The bell tower performance isn’t technically a tourist trap in that it doesn’t really cost any money. Yet still, I couldn’t help but feel a little ripped off after watching it. It’s an extremely famous and popular sight to witness, and the flocks of people surrounding the bell tower had definitely peaked my curiosity. Matej and Tomas must have been rolling their eyes as I stood on my tip-toes to peer over the crowd, but they knew it was something I would have to witness and judge for myself. When the hour rolled around, the chimes began to echo through the square, and little wooden doors opened up from the clock, and out came a small procession of figurines, which Tomas would later inform me were supposed to be a parade of the apostles. Above them, a skeleton emerged to ring a small bell, which clanged out over the crowd. Flashed from hundreds of cameras went off, and I waited eagerly to see what else would happen… The apostles did their loop and went back inside, and the skeleton eventually finished ringing his bell and retired back into the clock. There was a small cheer from the crowd in front of me. “That… wait, that was it? Everyone stood around waiting for that?” Don’t get me wrong, it was a cute display, and more than most clocks manage to do to entertain a crowd. But I just couldn’t believe that that was all it took to attract such an audience. Tomas and Matej both chuckled, having clearly anticipated my reaction. “It’s a tourist thing,” they both said. “You had to see it at least once.” As fate would have it, I ended up in the same part of town the following afternoon and purely by chance, I happened to be there on the hour. During the daylight hours it was easier to take some clearer photos, although I can’t say they’re that much more exciting than being there to witness the show first hand… which isn’t saying much. 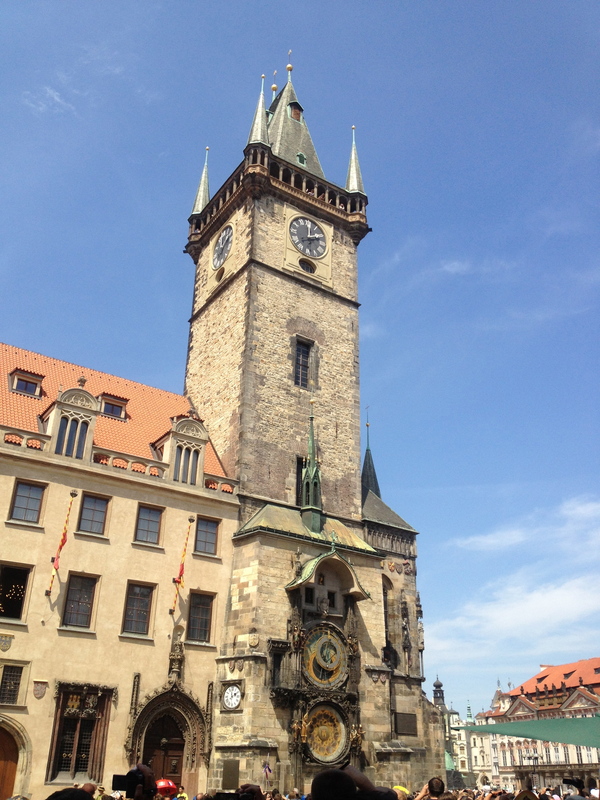 The Old Town Hall tower in the light of day, with the astronomical clock at the bottom. 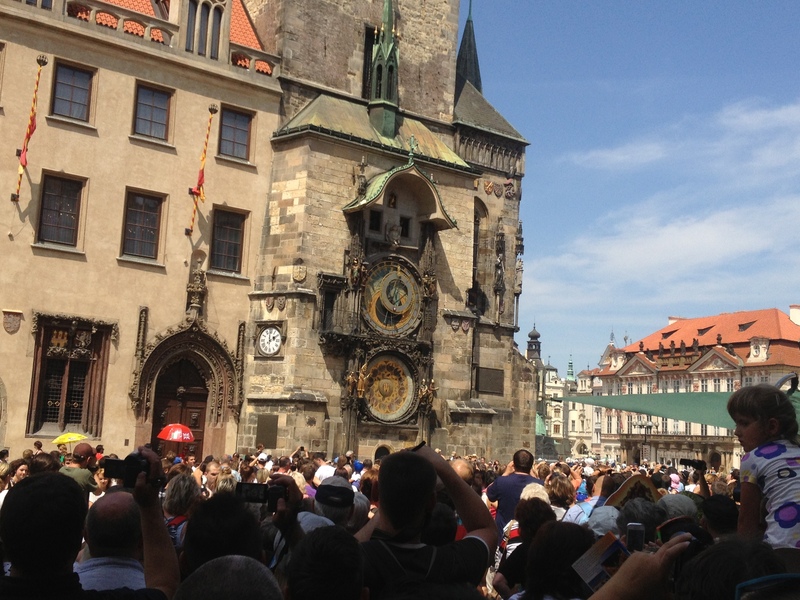 The crowds gathering around the astronomical clock to watch the rather anti-climactic performance. After that we wandered through some more of the town, exploring the old streets as I marvelled at the simple, intrinsic beauty of the place. Prague really did feel like a kingdom from a storybook, complete with a castle on the hill across the river, gazing down over the city. The three of us stopped by another one of the couples favourite bars on the way home, where we had a few more beers while Tomas told me more about Prague, while also interrogating me about my own journey and travels. They were both such sweet and lovely guys – I was starting to wonder when my luck at finding such nice hosts was going to run out. The two of them both had to work in the morning though, so we eventually stumbled back down the street to crash, and I would continue my exploring of the fairytale city on the morrow. For a trip that should only have taken approximately three hours, I spent a ridiculously long time getting to Prague from Vienna, but there were many factors I had to consider when planning out my day. The first was that Kathi and Anna-Greta would both be leaving before 9 o’clock in the morning, which meant that I would also have to leave at that time, since I would definitely need to be on a train out of Vienna before either of them finished work. Kathi was catching a tram in the same direction as myself – towards the train station – on her way to work, so when my stop finally came we said our warm, slightly emotional goodbyes, and promised that we would definitely see each other at some point in the future. She been a great girl and had been a lovely host, and I knew I had made the right decision in coming to Vienna and staying with her. 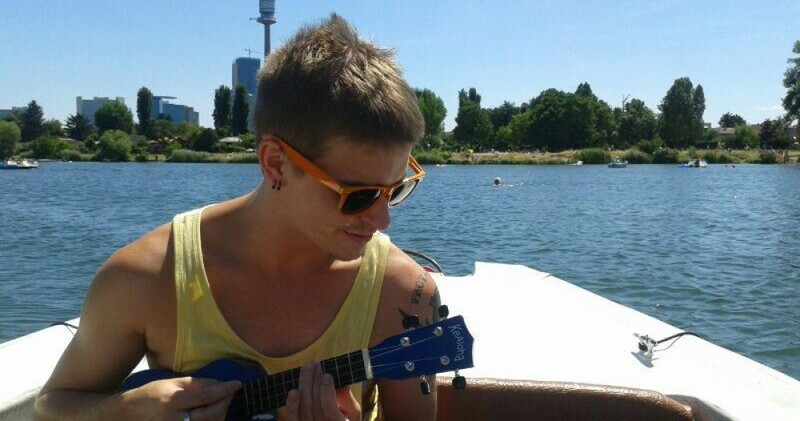 I had my next Couchsurfing hosts lined up for that evening in Prague – however, Tomas had informed me that no one would be home before 5 o’clock, so if I arrived in Prague before then I would have to look after myself until that time came. No big deal, I thought to myself. There was always pretty elementary things to take care of when arriving in a new city or country – for example, the Czech Republic’s currency was Czech crowns, or koruna, not the Euro, so I would have to exchange or withdraw some new money. There was also the possibility that trains would run late, so a three hour journey was still only a very approximate guess. The trains were not running late. Neither was I. However, the train station that I was departing from was not that same one that I had arrived in, and the layout of this new one was very confusing. There was English translations for pretty much everything, but it didn’t help me run any fast when I realised I had made a wrong turn and had three flights of stairs to run up with all my baggage to even make it to the entrance of the platform that I was supposed to be on. I made it just in time… to watch the train I had intended to catch slide out of the platform and down the tracks into the distance. Luckily for me, I hadn’t reserved a place on the train, so there was no financial harm done in missing it. It just meant I had to wait a lot longer at the train station for the next train heading to Prague. Or did I? I pulled out my iPhone and opened the Eurail app I had downloaded, which has listing of all the train stations on the Europeans rail network, as well as all the different times the trains run. It had saved me before when I was stranded in Hamburg, telling me exactly what trains I needed to catch in order to make to Groningen that same evening, and now it was giving me another piece of alternative advice. I could wait for a few hours at this platform, for the next direct train to Prague, or I could take a detour. 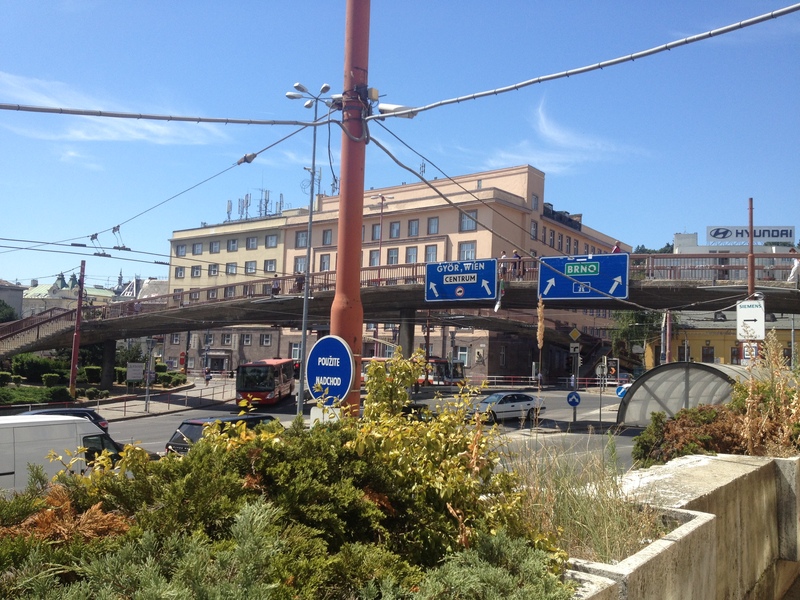 There is a regular route from Budapest in Hungary to Berlin, and Prague is one of the stops along the way. That train doesn’t pass through Vienna, but if I jumped on a different train I would be in Bratislava – the capital of Slovakia – in just under an hour, and would be able to intercept the train there. That was the beauty of the flexible Eurail pass I was using – I could catch as many of these unreserved trains as I liked in one day, and it would not cost me any extra as it would have to catch the single train to Prague. 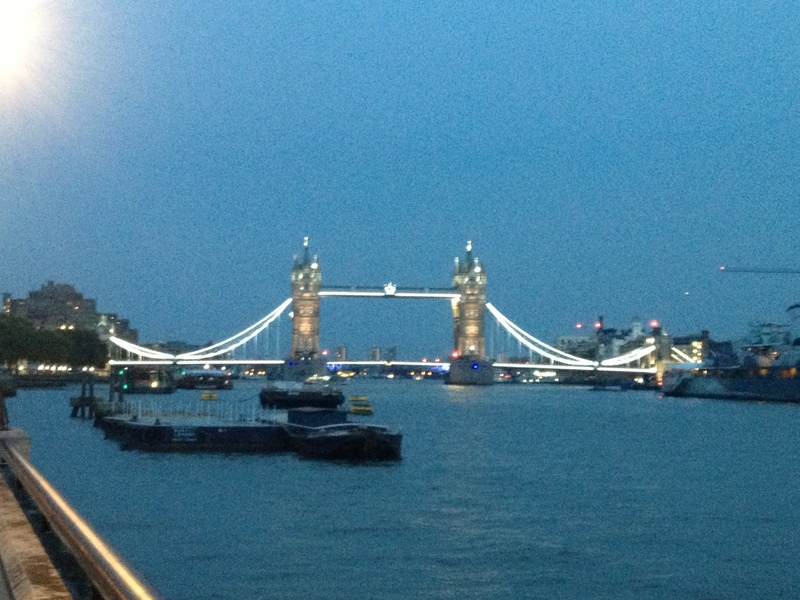 And, I got to visit another country and city along the way! All aboard for Eastern Europe! 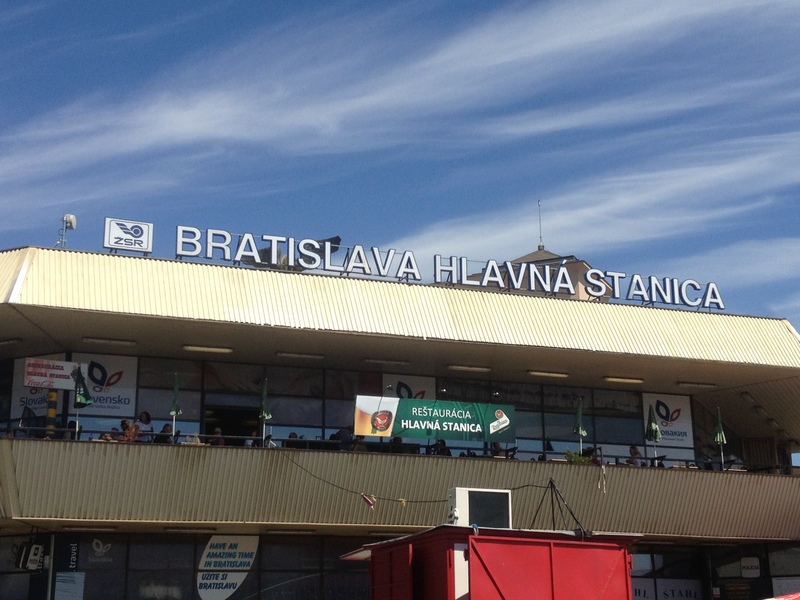 Despite having an entire day to get from Vienna to Prague, I didn’t have a couple of hours to spend in Bratislava – then entire length of my layover was about 45 minutes. Even so, that didn’t stop me from running out of the train station and down to the nearest main road to take a few photos as evidence that I had made it this far east. I still had all my luggage strapped to me, so it wasn’t as easy as you may think. Unfortunately, the train station isn’t that close to the historical centre, where all the more beautiful architecture can be found. I didn’t want to venture out into an unfamiliar city where I didn’t speak the language and had a deadline to return to – I didn’t want to miss another train – so I settled for taking photos of some street signs, whatever buildings I could see, and the front of the train station. 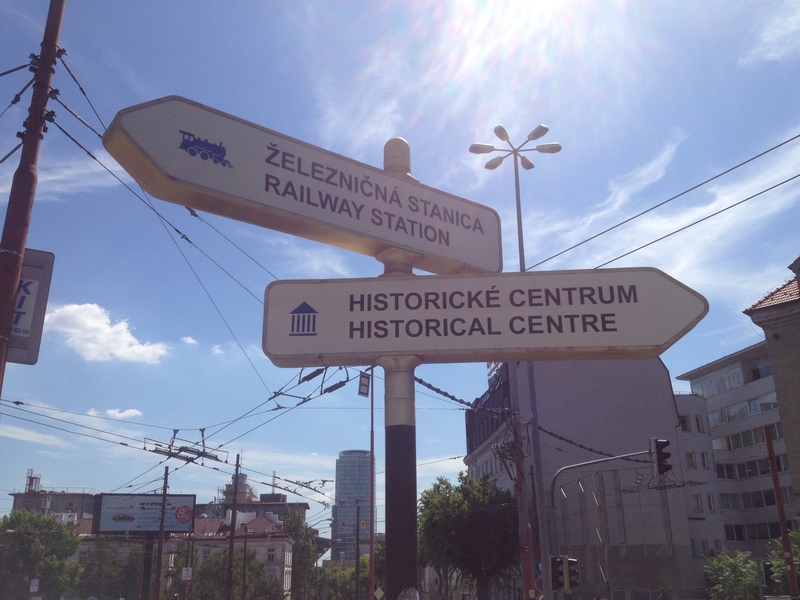 Sign pointing me towards the Historical Centre that I was unable to get to. 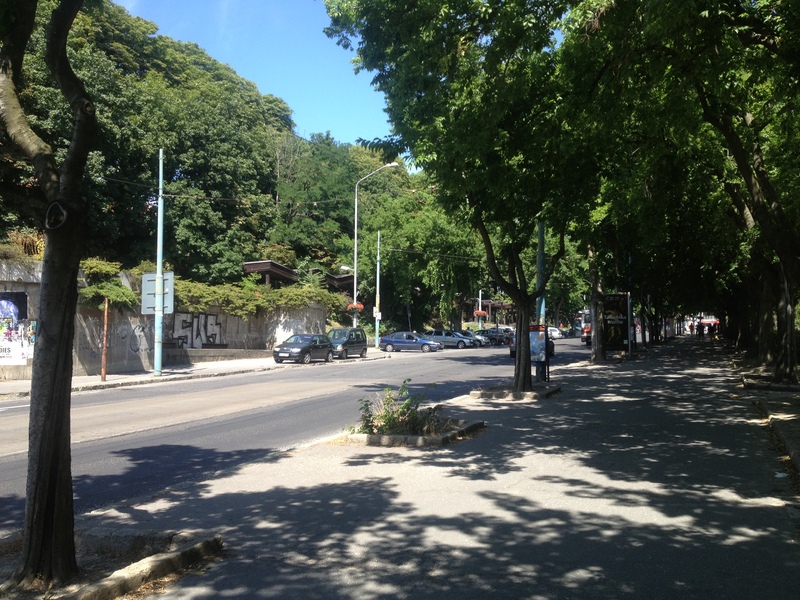 The sole street I walked down from the train station. 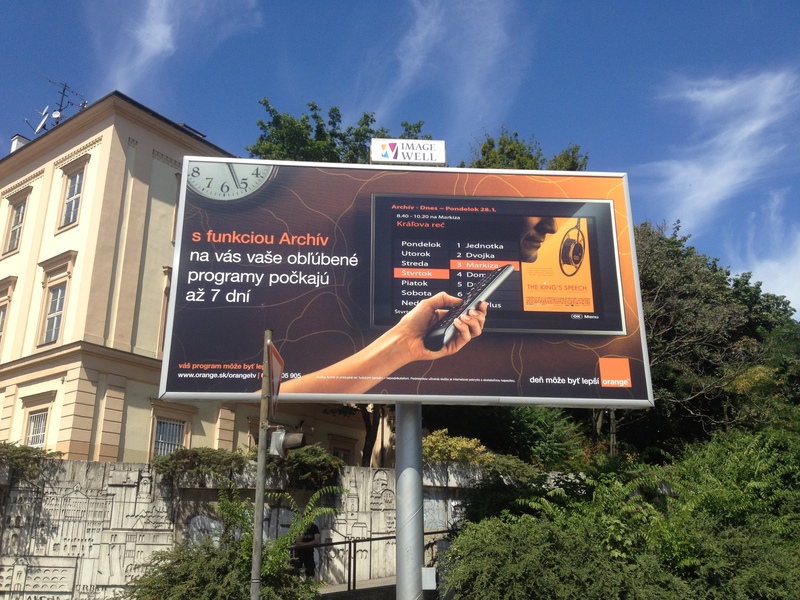 Slovak billboard – I was limited in the sights I was able to photograph, okay? 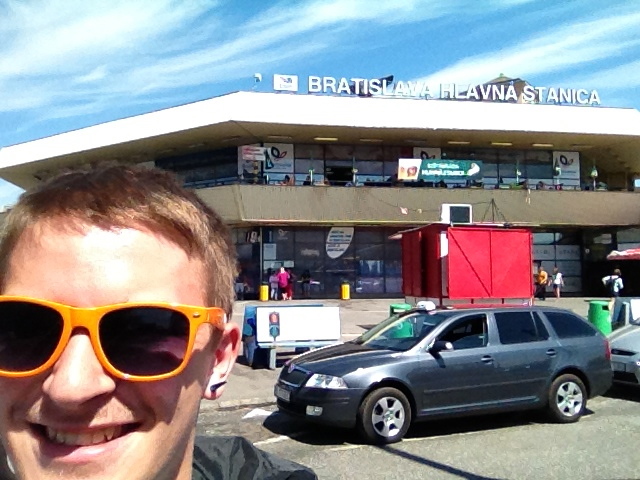 The train station at Bratislava. And a selfie to prove that I didn’t just steal these pictures off the Internet. Then it was back to the station to buy a few snacks before boarding the train to Prague. The train was unlike most of the other ones I’d been on throughout Europe. Rather than being much more open with rows of seats on either side of an aisle, this train was more like the cabins we had on the Trans-Siberian railway. They were closed off compartments with sliding doors, except instead of seats that folded out into beds there were simply six regular seats per compartment. I would later be told by Tomas, one of my hosts in Prague, that that style meant the train was rather old, but it seemed pretty clean and modern to me at the time. I walked down the halls and poked my head into the cabins until I found one that seemed manageable. The curtains were drawn, and there was a young man lying across three of the seats on one side of the cabin, apparently sleeping. 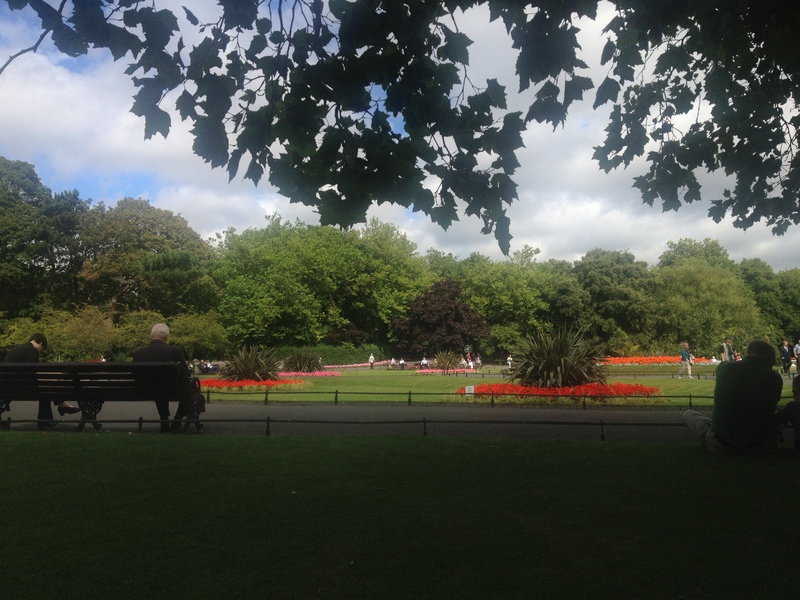 On the other side, an young woman who looked about my age sat by herself, looking rather timid. I squeezed in and took the window seat, peeking out the window through a crack in the curtain. The trip started out quite uneventful. After a while, the sleeping man sat up, rubbed his eyes, and threw open the curtains. He couldn’t have been much older than myself or the other girl who was sitting quietly to my right. He gathered up his things and, without a word to either of us, departed at one of the stops along the way. I can’t say I’m surprised at his silence – in these environments, with the tourists and local travellers thrown in altogether, its pure luck as to whether the people around you even speak your language. He was soon replaced by a family – a mother, father and small child. They would prove to be strange cabin companions, with the little boy being cheeky and misbehaving so much that we witnessed the father lose his temper and repeatedly smack the child. It was a little scary, but I didn’t say anything because I really had no idea if such kind of thing was normal in this part of the world. The child would start crying and wailing, before going back to whatever he had been doing before and earning himself another smack. This exchanged happened periodically throughout the whole journey. However, when they first climbed on board was also the time when someone came around to check our tickets. Mine had already been stamped on the train to Bratislava though, so all I had to do was flash my Eurail pass. When I pulled out my pass, the eyes of the girl sitting next to me lit up. I saw her pull out her own Eurail Pass to show the the train attendants, which meant that she had to be a non-European resident. We got chatting after that – Itzel was a traveller from Mexico who was also backpacking around Europe after spending some time studying abroad in France. We got talking about different places we’d been to and where we were going. Itzel had gotten on the train in Budapest, somewhere that was now not on my itinerary but somewhere I had really wanted to see, so she told me all about the city and the things she did there. It sounded like a pretty fun place, and Itzel said she had an awesome time. She was doing the full length of the train route, from Budapest to Berlin, so after that I was my turn to rant and rave about my favourite European city. I told her all about the crazy things I’d done and where she should go, and how to not get turned away from Berghain. She had a hostel booked in advance as well, so I pulled out my Lonely Planet book and showed her the way to get there from the train station. 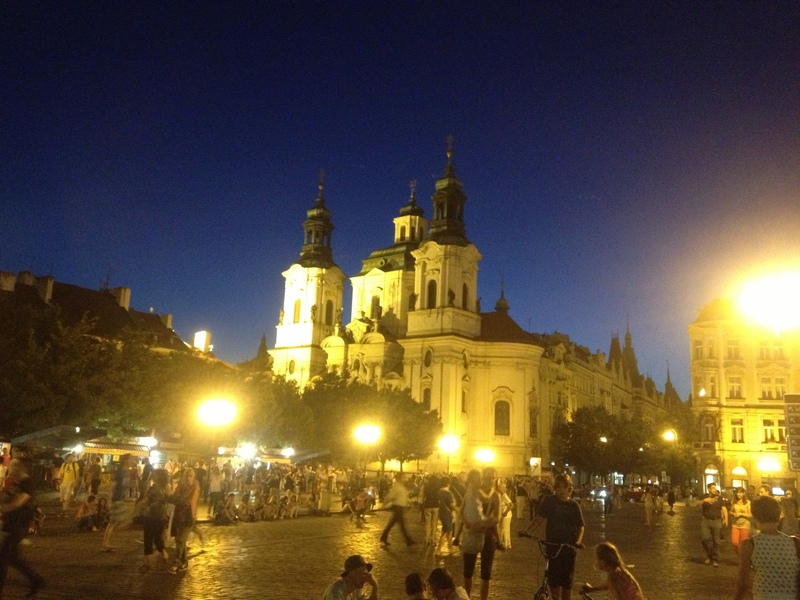 As it would happen, Itzel had also been to Prague, so she told me as much as she could about the city. “It’s a cute city, pretty small, and it’s easy to get around with the public transport. And of course there’s the castle.” I’d heard a lot of good things about Prague, but I guess I would be finding it all out for myself in a few hours. Itzel and I continued to talk the entire journey – I could hardly believe how much time had passed when my stop crept up on us. I said my goodbyes to Itzel, but we exchanged contact details just in case our paths crossed again in Europe, or if I ever found myself in Mexico on my future travels. I really enjoy the way travel brings people together like that – maybe I won’t see Itzel for months or years. Perhaps I’ll never see her again. But for that shared moment of travel we became the best of friends, and the train trip to Prague would have been quite boring without her.